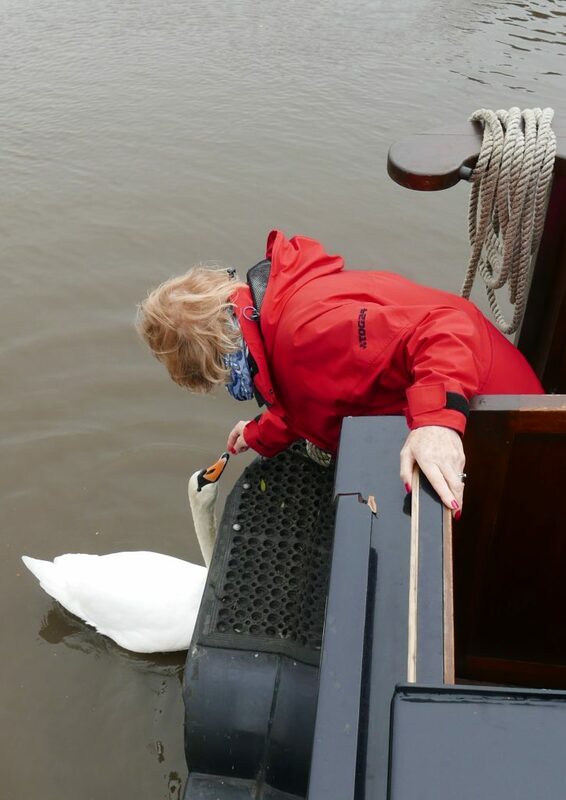 A lovely day today feeding swans and doing swing bridges. After yesterdays bit of rain, though the Five rise was dry, it was a gorgeous day today. Don and June many thanks for this picture, we do know who the boss is on Lady Teal ! 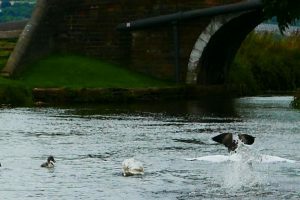 For a few years now some geese, now down to one, have been hanging around with a pair of swans on the Leeds Liverpool near Rodley. 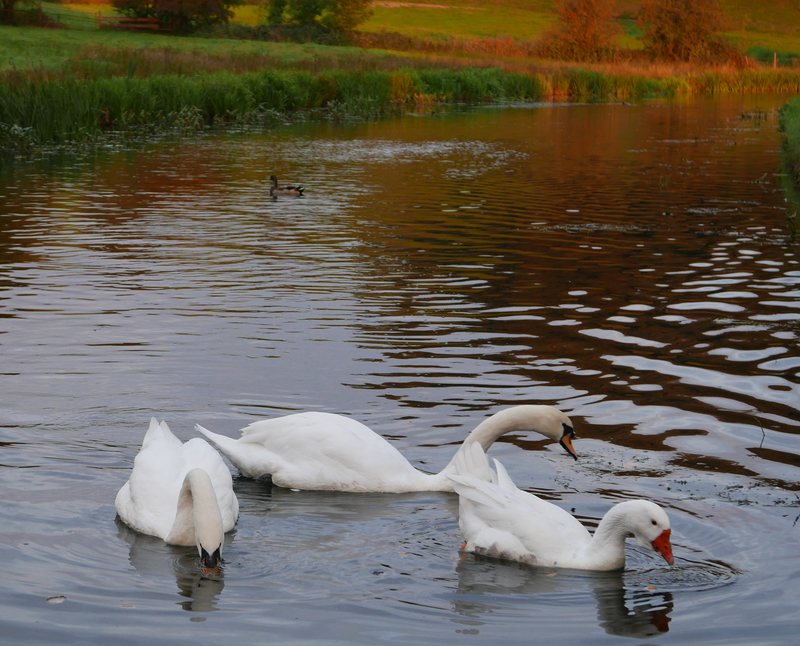 Before the swans had young the geese would swim in between the swans like cygnets do. But then the swans had some young and the geese were relegated to the rear! One of the geese has disappeared but the other stills hangs around. The swans tolerate it, but will chase it away from food. I don’t know if the goose thinks it is a swan or not but they all seem quiet happy together, rather cute. 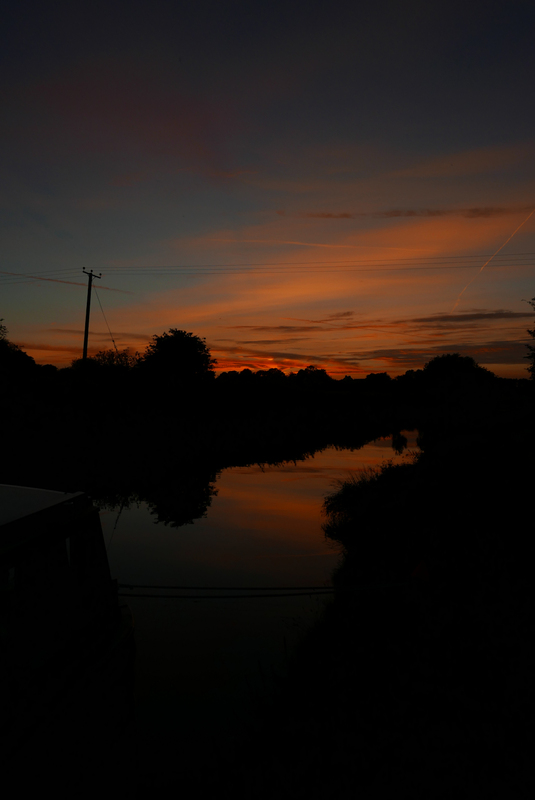 Lovely sunset on the Aire & Calder near Leeds followed by glorious morning. How lucky is Lady Teal to travel these waters. 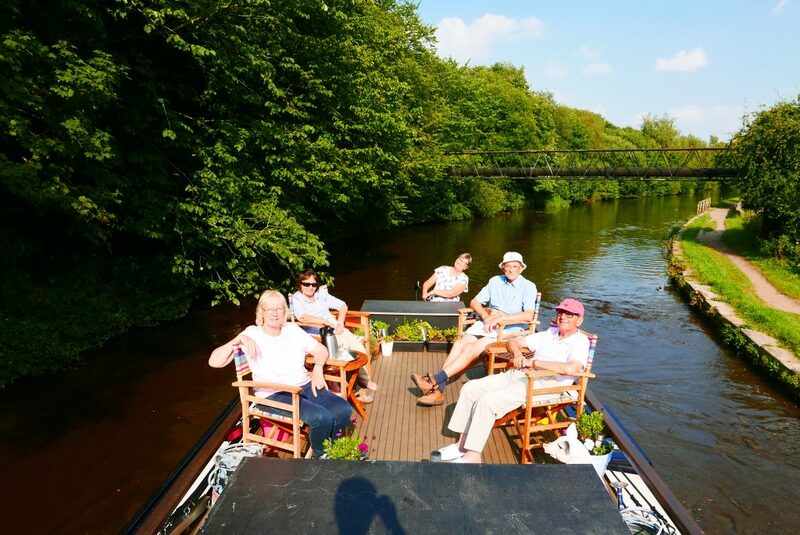 Great for the guests on Lady Teal to see historic Leeds & Liverpool shortboat Ribble doing a loaded run along the L&L for the bi-centenary. 32 tons of sand going from down on the Aire and Caldr across to Liverpool, brilliant. First time we have seen an L&L short loaded up and going along. 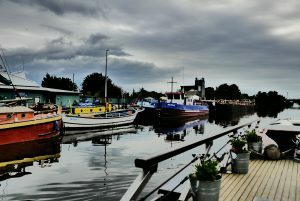 It is fun going down into Goole with the big ships and the South Yorks Boat Museum. Coudn’t resist being a bit arty with the tug pushing the false bow from the Tom Puddings. 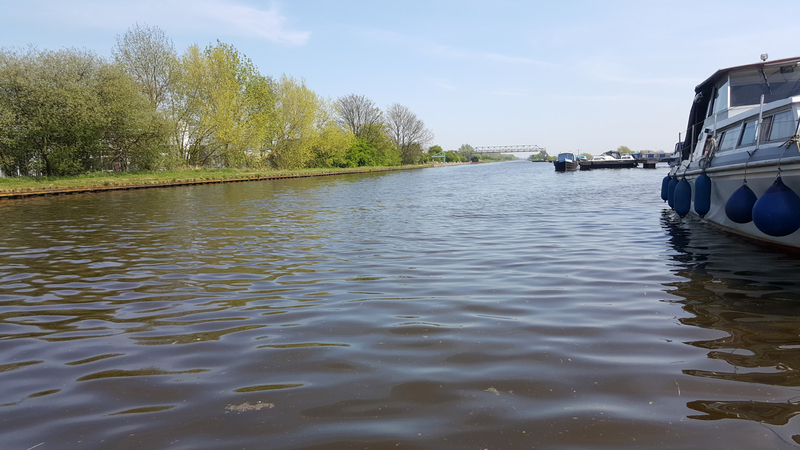 In 1817, there was a proposal for an Aire and Don Canal, to connect Knottingley to the Dutch River at Newbridge, with a branch to Doncaster, and another for a Went and Wakefield Canal, to connect Cold Hindley on the Barnsley Canal to Newbridge on the Don. With revenue from tolls reaching £82,092 in 1818, which enabled a dividend of £54,000 to be paid, the company was in a healthy state, and proposed their own route from Haddlesey to the Dutch River. The destination was then changed to Goole. 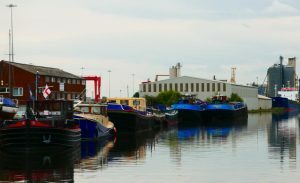 John Rennie was asked to survey the route and proposed the construction of docks at Goole, rather than a lock into the river. Construction at Goole started on 28 September 1822, and the company eventually built much of the new town and docks. So that’s Lady Teal mixes with the big boats, or ships! Now I told Gina to avoid the nuclear power station! Dropping off the end of the Leeds Liverpool we find ourselves on the Aire and Calder, actually at that point it is the river Aire and after pasing through the Leeds flood alleviation works we end up on the Aire and Calder naviagtion. Time for a quick pre-lunch drink at Lemonroyd. Also very lucky to meet up with Whistle down the wind. 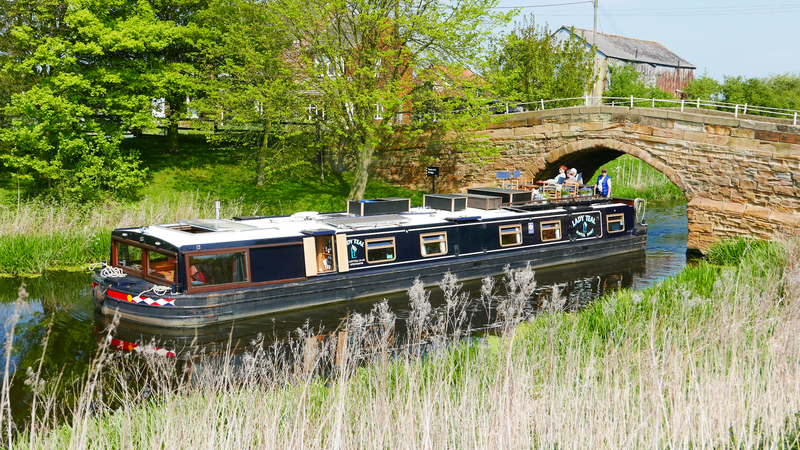 A great steam narrowboat that lives up on the Leeds Liverpool Canal, superb vessel. Well here we are again in wonderful Granary Wharf Leeds. Leeds is such a great city, we are so lucky to ply between the two superb cities of Leeds and Liverpool. So much to see and do here and the terminus warehouse that is so attractive. The guests sat on top for a cocktail and canapes to kick off the skippers evening. 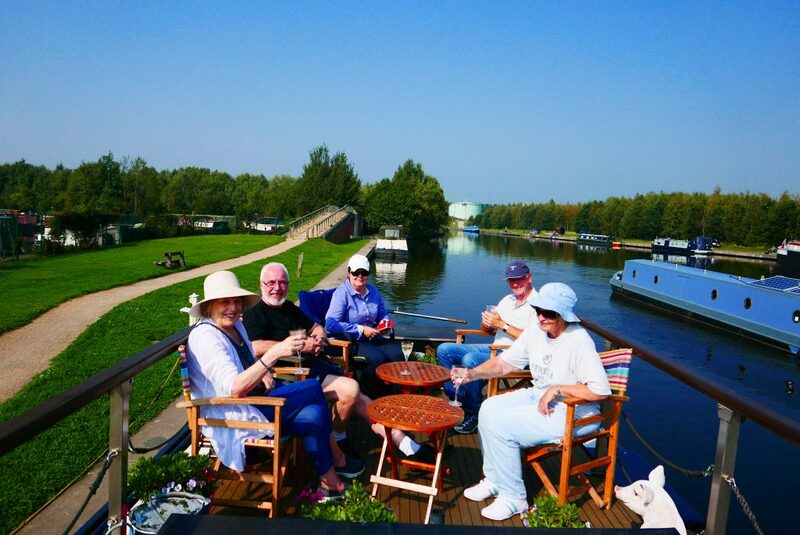 Off to sunny Goole tomorrow, a brilliant run on the river and navigation, though yesterdays storm did bring the river up it is subsiding now. The river and navigation is so different to the canal with the added width and depth of water making the boat handle very differently. What a brilliant place to wake up to! 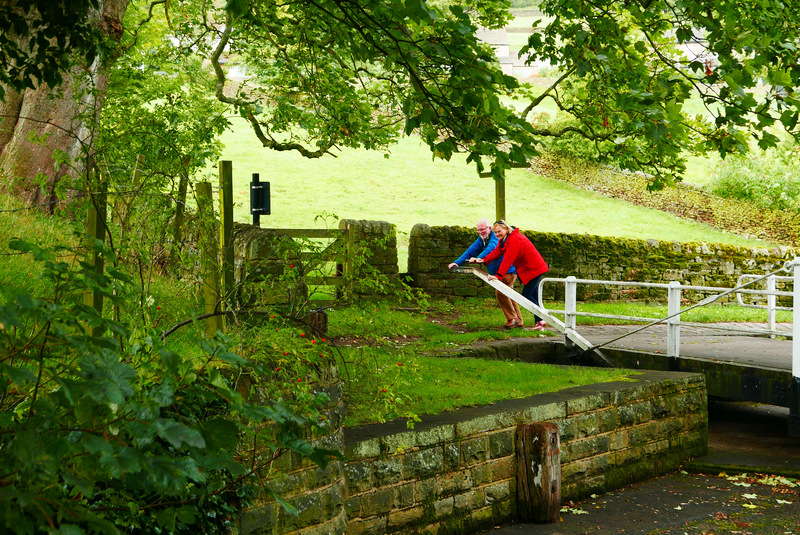 Then it was on to the Bingley 5 Rise. 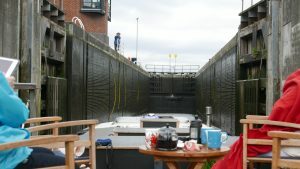 This fabulous set of locks is the steepest flight of locks in the UK, with a gradient of about 1:5 (a rise of 59ft 2in (18.03m) over a distance of 320 ft) with the intermediate and bottom gates being the tallest in the country. Staircase, or riser locks, are locks where the bottom gates of one lock form the top gates of the next lock. 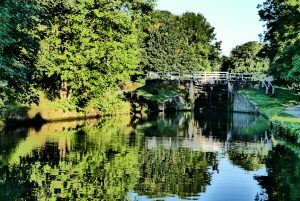 When the locks were opened in 1774 a crowd of 30,000 people turned out to celebrate. The first boat to use the locks took just 28 minutes. 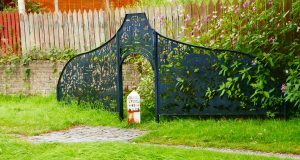 The technology of riser locks, was out-of-date by the 1770s, when they were built. 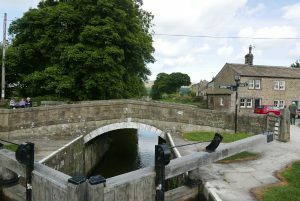 Riser locks on the Leeds & Liverpool Canal were probably used to keep costs down as the project was financed privately. Riser locks use much more water than conventional ones as boats cannot pass in them. As trade increased, the five-rise locks at Bingley created a constant water supply problem for the canal company. Consideration was given to replacing them with an incline plane or separate locks, but the options were never financially viable. 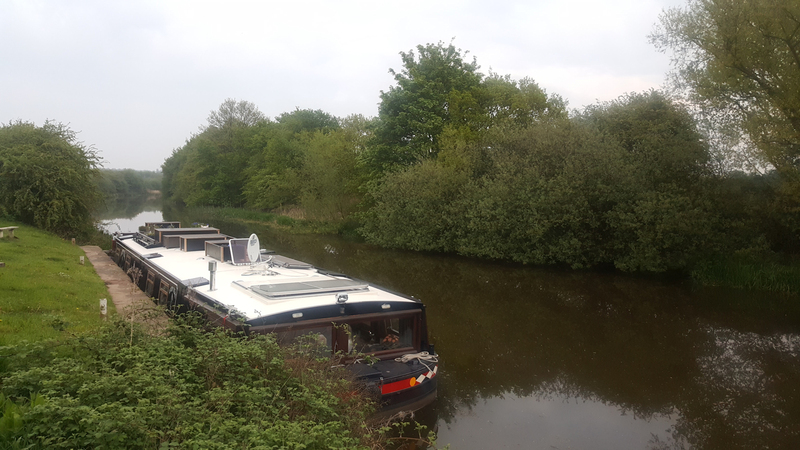 Another brilliant overnight mooring for Lay teal on the Lees Liverpool heading down toward Bingley, so down the wonderful Five Rise tomorrow. 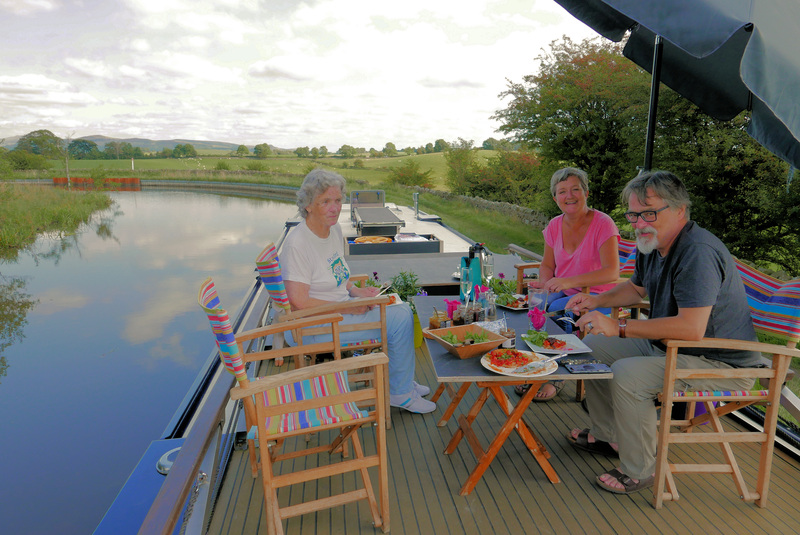 Such a lovely day and such a lovely spot, lets lunch outside, fabulous Al Fresco lunch on Lady Teal. We were up on the curly wurlies in the Yorkshire Dales. 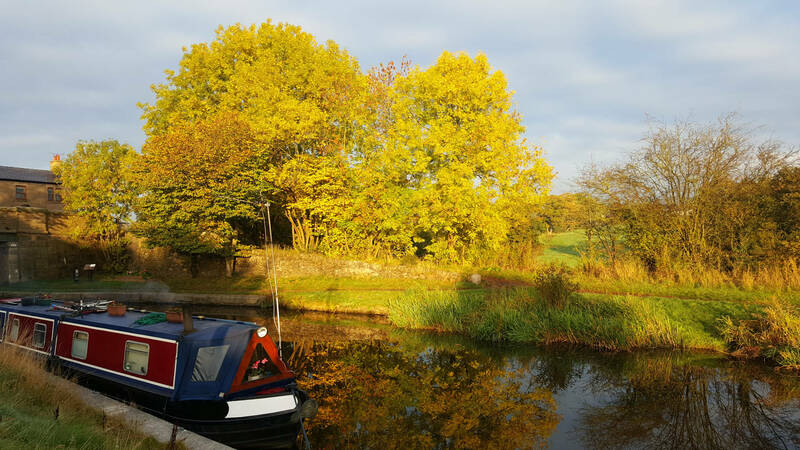 Mooring at Greenberfield is so lovely, we are lucky with so many wonderful spots to moor and not much traffic to mess us up! Greenberfield is also interesting, to the canal geeks like me! There used to be a staircase lock here but when it fell into disrepair it was decided to go for a more efficient set up and put in a new line and three separate locks. I gather there was a bit of a row as the road had to re-route and a new bridge go in. The original bridge is now stranded, disused in the back garden of the old lock keepers house. You can see where the line used to go and the old tow path. This change all happened in the 1820’s, so only about 30 years after the section opened. Foulridge tunnel is the longest of the tunnels we go through, nearly a mile long but you can see right through it. The tunnel was built two thirds cut and cover due to the difficult ground and there are no records of anyone being killed in its building, which is quite amazing. 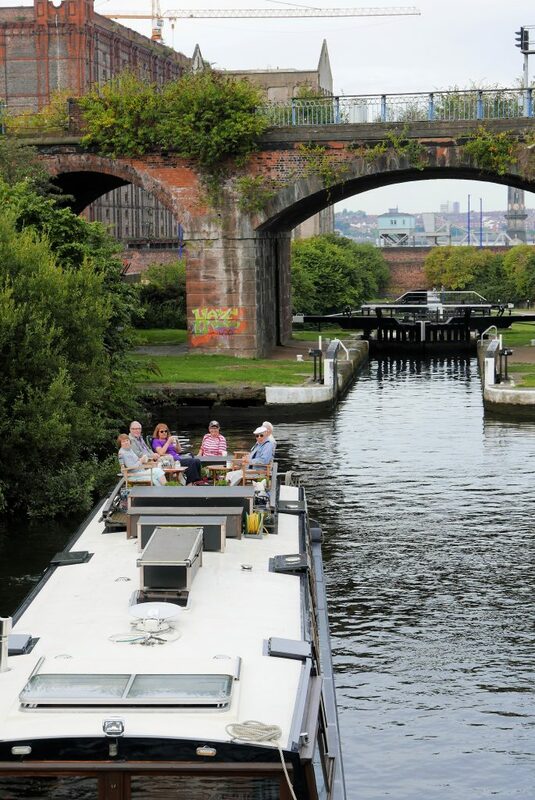 Having no tow path and only being as wide as we are traffic lights control the flow of boats through it. Guests love going through as its all twinkly. As with all tunnels there is the inevitable story of a cow swimming through it. 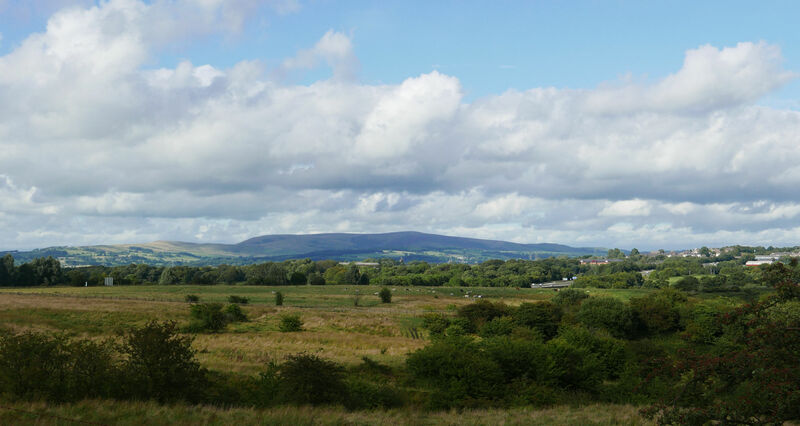 The lovely Lancashire countryside is up to any in the country and is far too easily overlooked. We always think of gritty mill towns, Blackburn, Burnley and Wigan and forget the wonderful countryside that surrounds them. 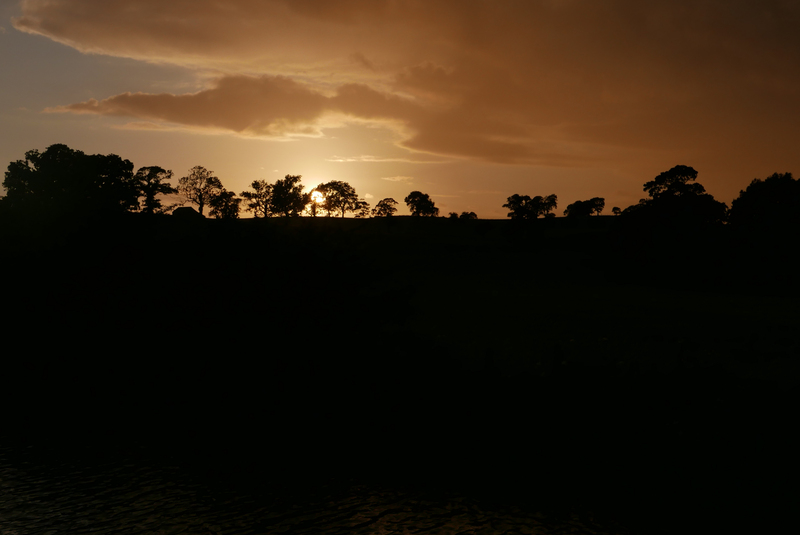 Passing through it really is a pleasure, and as you all know I can never resist a sunset! Well here we are again at one of our favourite flights, Johnson Hillocks. Is it really that far to Leeds, then onto Goole! A lovely lunch spot on the Leeds Liverpool. Apply lock is a single deep lock though in the past, to save water two individual locks were put in operation. Unfortunately these are now in disprepair, but it does make a lovely spot for lunch. 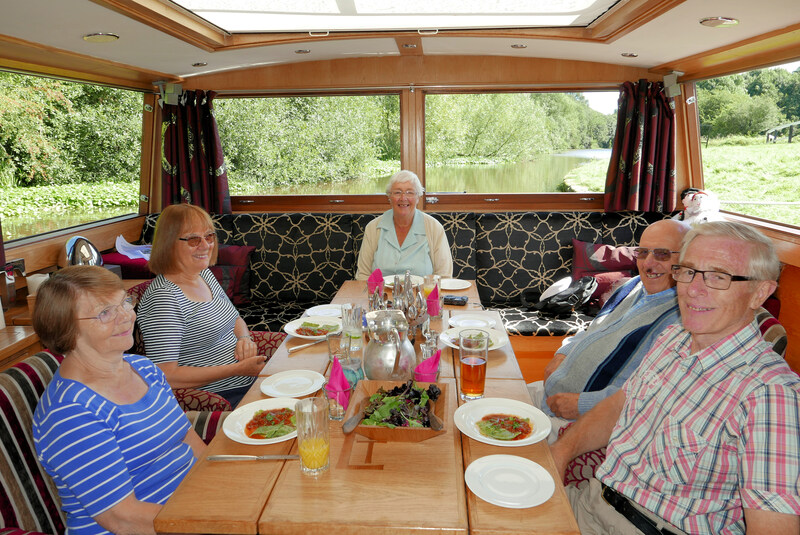 A beer, glass of wine and a lovely lunch on Lady Teal, so the guests say! John Longbotham was the canal engineer put in charge of the building of the Leeds Liverpool. As you can imagine this was a bit of an interesting one given it was necessary to team up Lancastrians and Yorkshiremen! To try and deal with this in a balance way they stare at both side of the country. In Lancashire that , for some reason, was not at Liverpool but was at Haskayne. One of the few cuttings through a hill, maybe they wanted the stone. 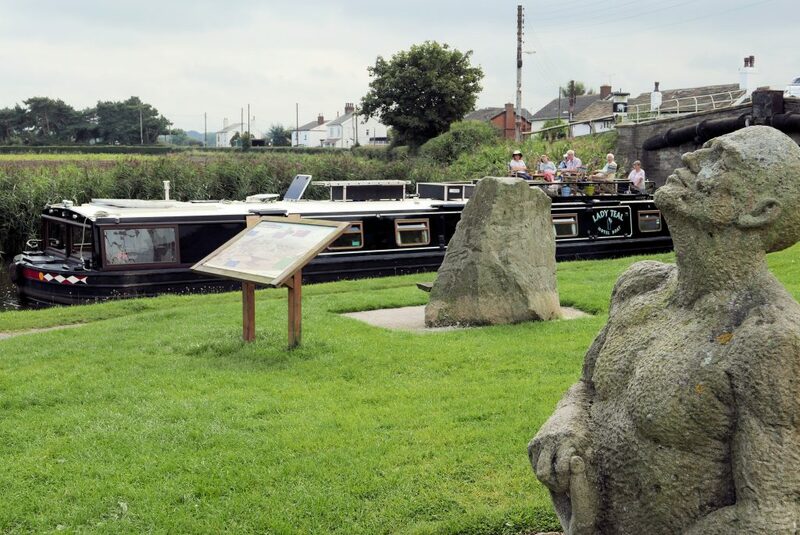 We went through Halsall today and we love the memorial to the men who built the canal . The Navvy , by Thomas Dagnall, is in Millstone Grit and is brilliant. Whilst most people believe that the navvies were all Irish this is probably not true, most were local men after a job. It was only later that more Irish men appeared. The work was undertaken by small contractors and few records survive to be absolutely sure. 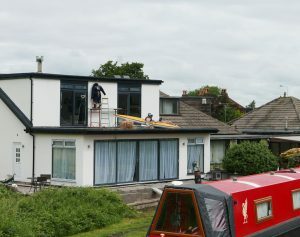 Well its goodbye to Liverpool for another year. We do so enjoy the run in and our time in Salthouse. Albert dock is so impressive, one of the first truly fireproof warehouses with no wood being used. They still had to have a hit squad fire team as stored items could catch fire but it could not spread to the warehouse with its stone and brick floors, metal window frames and cast iron columns, they wanted granite but it was too expensive. Passing out of Salthouse Dock its through Albert, into Mann Island Lock then through the Pier head tunnels past the three graces before going through Princess Lock and round the corner past the Titanic hotel, in the old rum warehouse, past Tobacco warehouse and up the Stanley flight locks back onto the Leeds Liverpool. Just look at the amazing tobacco warehouse in the background. Currently we are on a short break in Liverpool, it really is a great city. We love spending some time here. Lots of history, museums, galleries, shops, bars and restaurants fab. 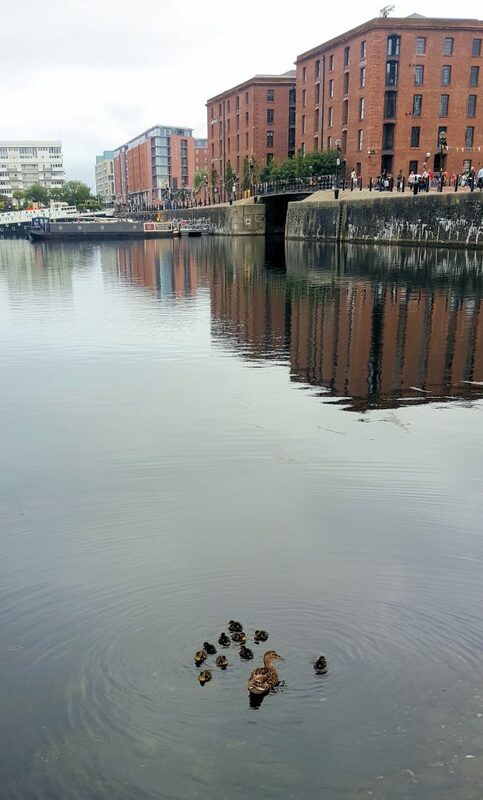 Well I didn’t expect to see these in Salthouse dock, never even seen one duck before, though clearly there have been at least 2! 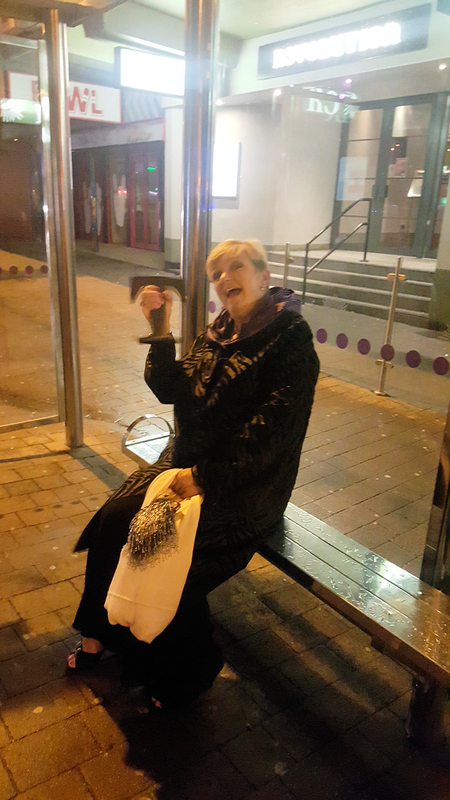 Well another lovely trip into Liverpool. Great weather and such a brilliant trip through the docks. 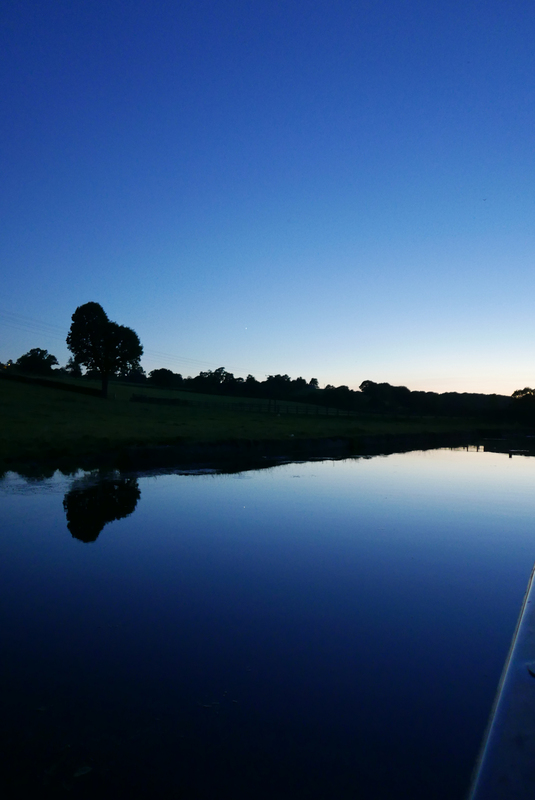 There really is no other experience like this on the waterways. Coming through the docks, the tunnels and then there are the three graces, what a sky line. But of course no visit would be complete without a Nick history lecture and a rapt audience. 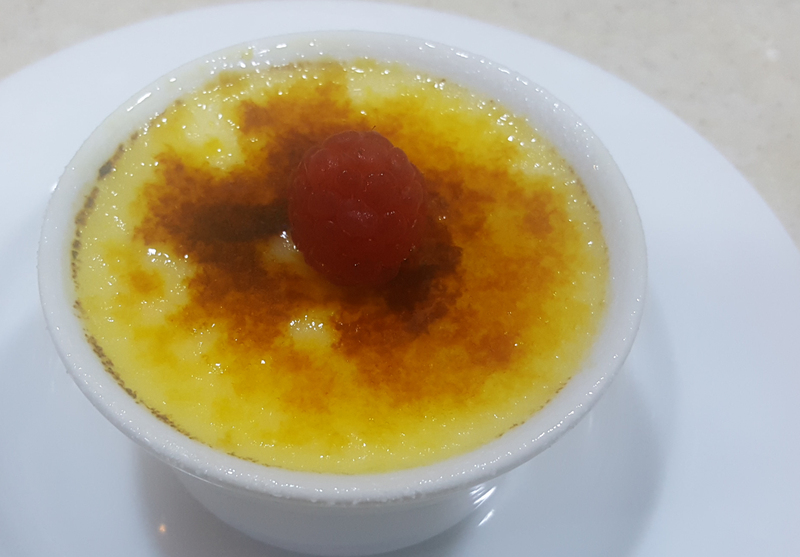 Having got into Liverpool there is a time for a quick explore then dinner, finishing, well apart from the cheese, port and coffee with a lovely Raspbery Creme Brulee. Well not the best of days, a tad damp. Then when we stop the sky clears and the sun comes out gorgeous! Yesterday was simply wonderful and guests enjoyed a glass of wine and sit on top as we cruised into Crook. A lovely spot now but would have been a pit village with something like 11 pits in the local area and lots of barges taking coal away. Even a tunnel underground for the canal. Tony Robinson did a really good Walking Through History episode really good episode on the stretch Liverpool to Wigan well worth a watch on More4. There seem to be a lot of myths and folk memory associated with the Wigan Flight. I first went through it in the lat 70’s and it was a mess. Punds empty, rubbish and most of the lock gear not working, environment industrial and pretty naff. How time changes things. Yes it is still 21 locks dropping over 200 feet and yes they are broad locks so harder work than the narrow ones, but we only do wide locks so don’t find them too bad. there are a couple that are tough but we generally take around 4 hours to come down, without trying to rush. You can stop at the wood yard for lunch if you want a break. It is tree lined and neat and tidy without too much rubbish, surprisingly. Also people have always been fine, none of the trouble that people seem afraid of, and we have gone on all days of the week and started at midday or at 0930. If you look on the right of the next photo you can see a church spire, we end welbelow the church, quite amazing, a great day. In the period that little work was happening on the Leeds Liverpool the Lancaster canal company seemed to be building bits of canal and linking them with tramways. Walton summit and the piece across from wigan being examples of the Lancaster tramways. 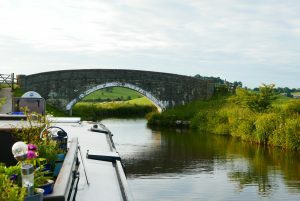 Passing over the Ribble on a large trestle bridge. 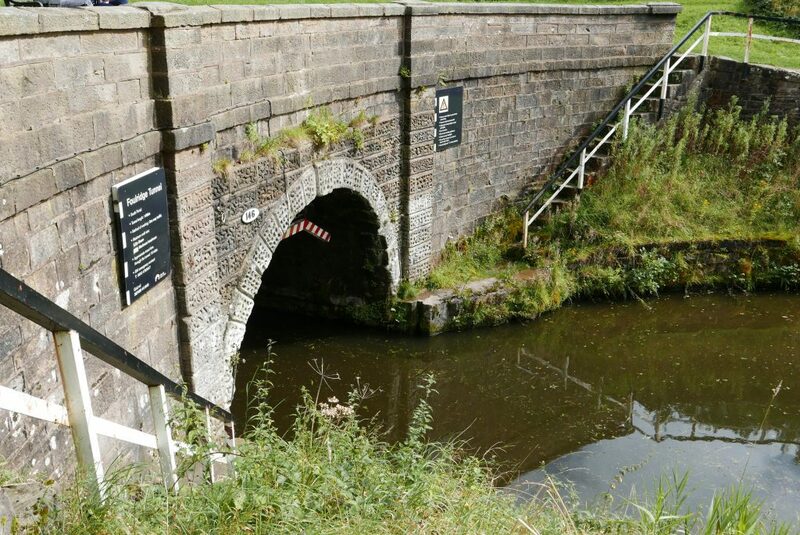 This led to the eventual leasing and taking over of the Johnson Hillocks to Wigan section of Lancaster Canal by the Leeds Liverpool, hence the dad end at the top of Wigan Locks, a lovely bridge over a canal that goes nowhere. It was a fascinating time for canal builders and tram roads that would be replaced by railways. 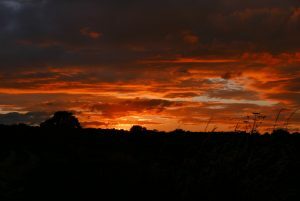 Well those of you who follow this blog, thank you, but you will know I love my sunsets. Here is a moonscape and a sunset. No photoshop just playing with under exposure whilst taking the picture. 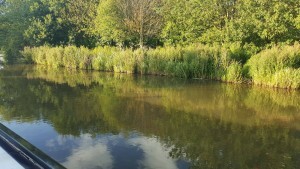 This is a lovely spot toward Wigan by Haigh Hall golf course. Lovely views down toward the direction of Liverpool, where the mighty Wigan flight will take us. 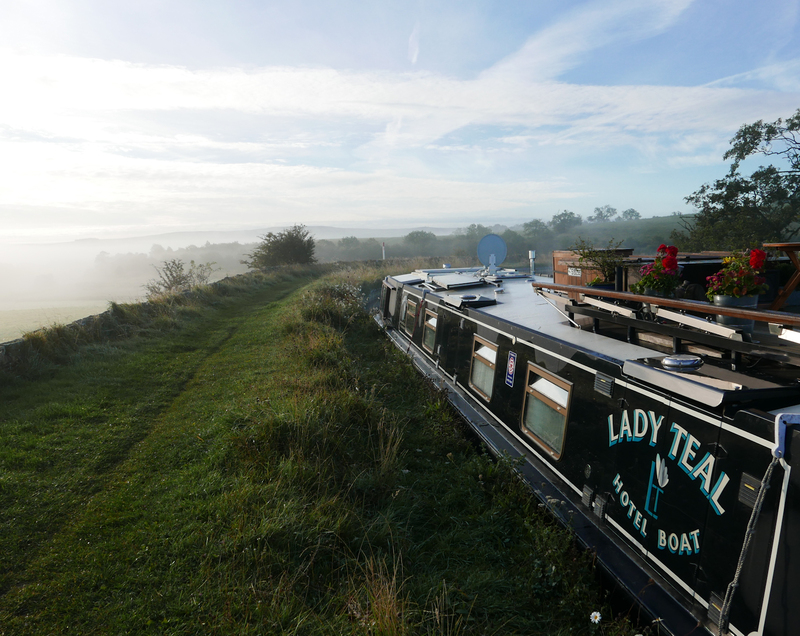 A lovely overnight mooring for Lady Teal as we approach the fab locks at Johnson Hillocks. We do enjoy taking Lady Teal through this flight as we meander, down or up. An interesting flight, for geeks like me! They were built as part of the Lancaster canal then leased and bought by the Leeds Liverpool once the final route was decided. Oh dear, it was one of the reasons lengthening did not happen as all the locks would have had to be totally rebuilt. 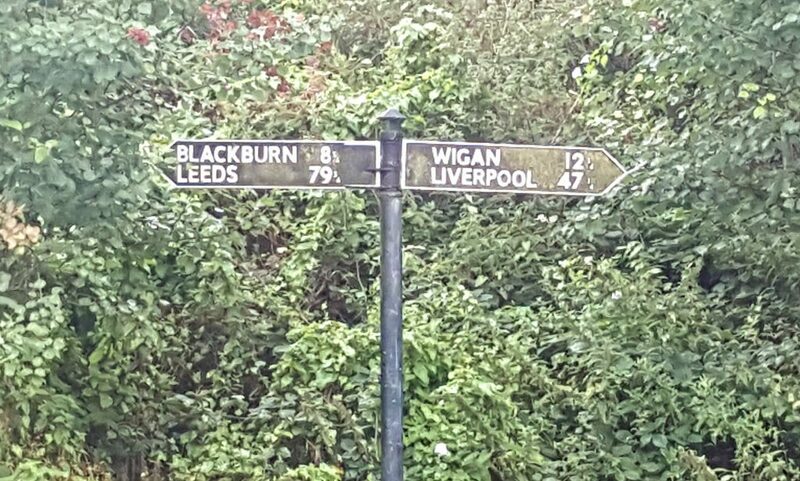 Where we stop tonight & just how long is the Leeds Liverpool, where is half way? 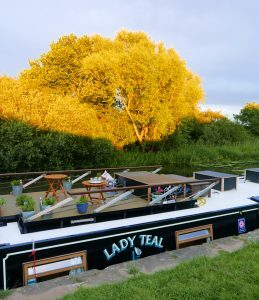 A bit of a damp start on the Leeds Liverpool, but now a sunny evening for Lady Teal, at the half way point. The lovely Lancashire views never fail to enthrall me. Lovely sky and view across the valley. Really is lovely. But just before we got here we watched a pair of swans chasing away some Canada Geese to protect their cygnets. No actual violence, on this occasion but they do look threatening. We have watched them try to drown ducks and Geese but not on this occasion. 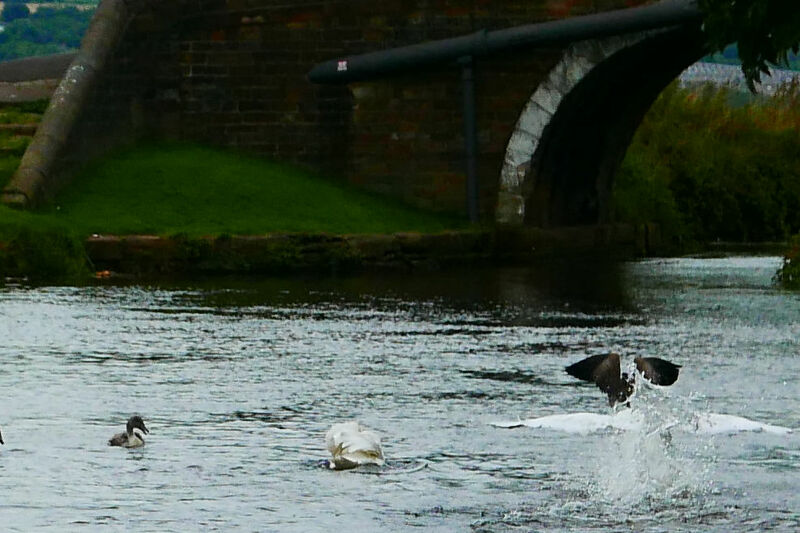 Urban myth has it that Swans can break your arm , but it seems unlikely as their wings are not that strong. I have separated fighting swans and not suffered even a bruise. The beaks have some sharp bits but they are more uncomfortable than damaging to us. But onto my other question, just how long is the Leeds Liverpool now? A marker, not an original mile marker is at Eldonian village in Liverpool and shows 127 miles, this is now the end of the canal and their is no distance marker on the original terminus warehouse at Pall Mall, now filled in. 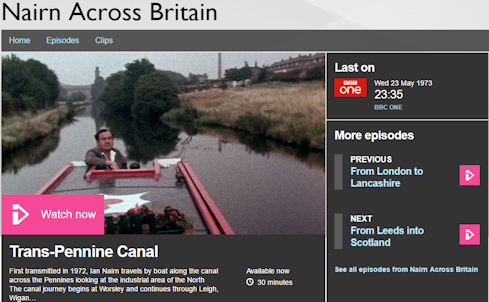 So is the canal now only 127 miles long, or even less, there seems to be no definitive answer. 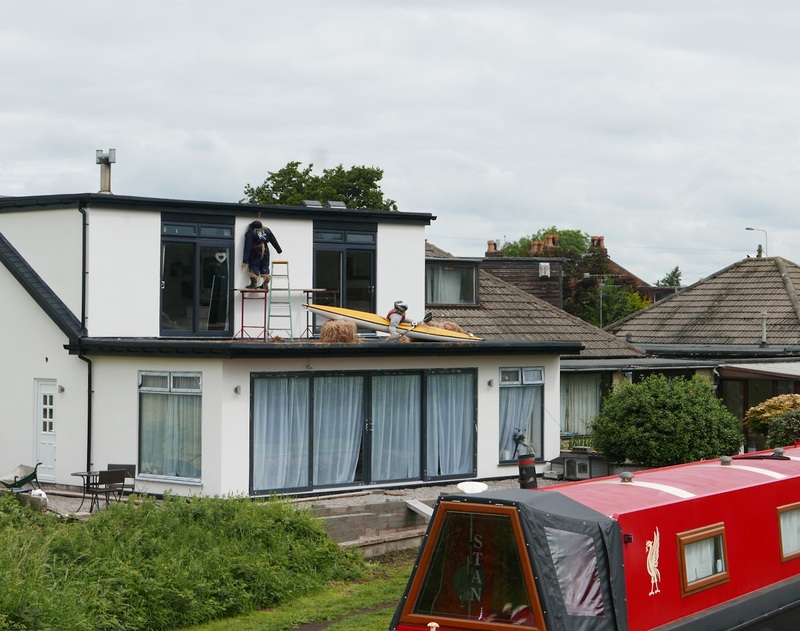 Here is the official half way point, more or less based on the canals original length. Mile markers, quarter and half, became most important when the toll act was passed in the 1890’s. The Act of Parliament of 1893 is entitled: ‘Canal Rates Tolls and Charges (Leeds and Liverpool Canal) Order Confirmation Act’. This Act left little room for haggling between the canal company and the owners of the goods to be carried on its canals. Let me quote from the Act to illustrate how detailed was that regulation. It reads: “16. For a fraction of a penny in the gross amount of rates, tolls, and charges for any consignment for the entire distance conveyed, the Company may charge a penny.” And… “18. All stone, when conveyed by the Company, shall be charged by weight when the weight can be conveniently ascertained. 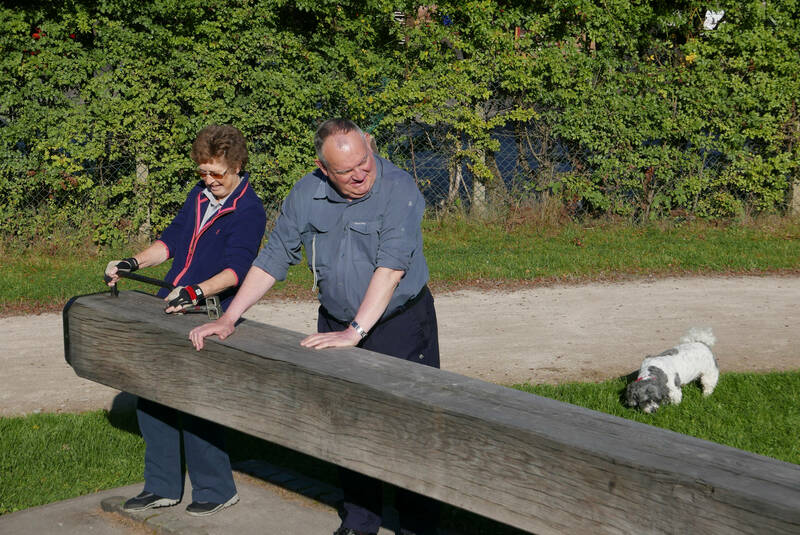 CRT are replacing or repairing all the mile posts for the bicentenary, which is great. 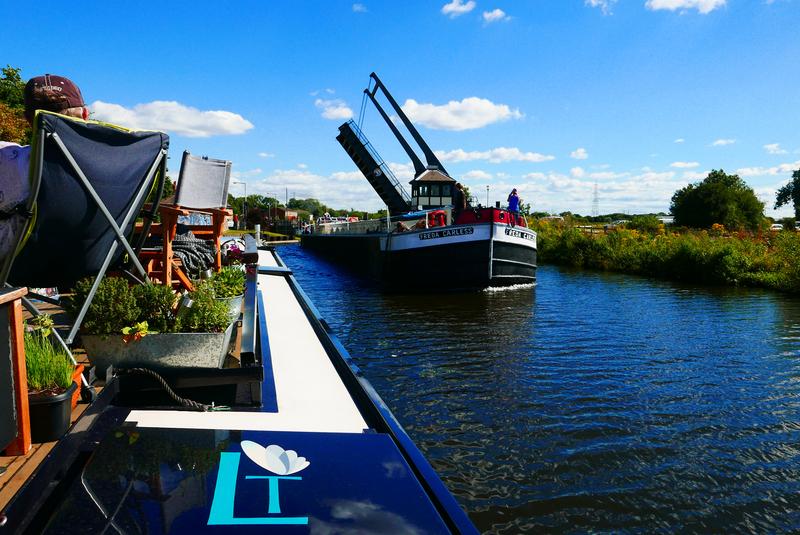 This really is a lovely section of the Leeds Liverpool that we love taking Lady Teal across. We have small aqueducts, lovely flights of locks and amazing views. We are so lucky to have all this to go through. 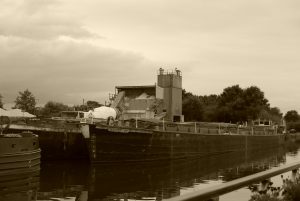 The first picture today is at Stegneck lock first thing in the morning. Then it was across Priest Holme Aqueduct crossing the River Aire. Not one of the largest or best known aqueducts maybe but nevertheless a lovely one. 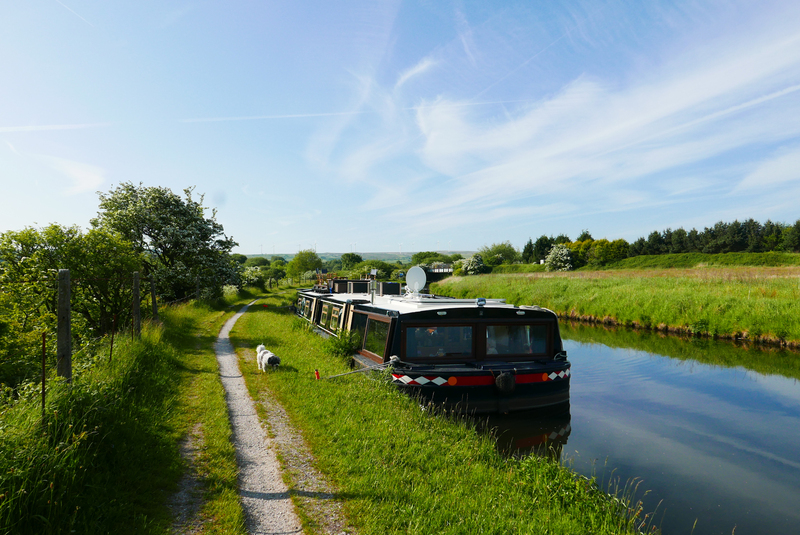 A lovely run up through Skipton, fuel at Pennine cruisers, always seem to have it and at a fair price, not true of all marinas. The Aire valley was a little windy, it can be relly bad, the swing bridges are protected to stop you being blown into them. We love the Leeds Liverpool. Up above Holme lock there is a great little stable block and the old register house, unfortunately in a state of collapse now, 4 years ago it was pretty much complete, shouldn’t CRT heritage be saving things like that not just fussing over things others do? 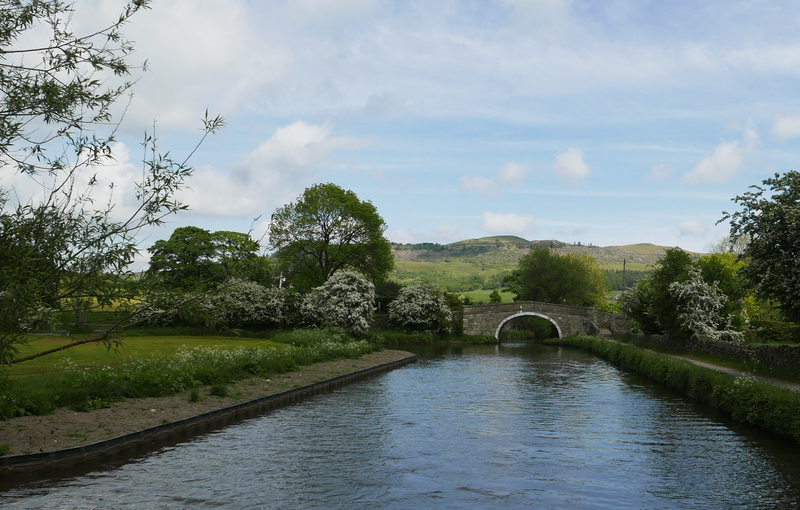 A neat little aqueduct and then up through Gargrave a pleasant dales village, then off the other side heading to Bank Newton locks, more of them tomorrow. A lovely sunset, OK I stopped this down a lot for effect, but I think its pretty cool. 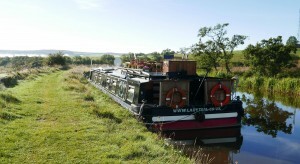 #HotelBoat A lovely morning at Hirst, guests have seen a Kingfisher having its breakfast, brilliant. A couple of pictures of Hirst, one a bit arty effect and one bright colours, I quite like the slightly arty one, I think. Today we have the amazing Bingley 5 Rise. This is either a staircase lock, the top gates of one lock forming the botttom gates of the next or for the geeks among us it is technically a riser lock. 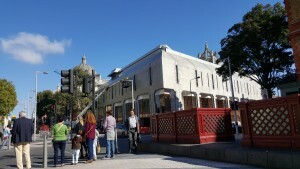 It rises 59 feet 2 inches over a distance of 320 fet and the intermediate bottom gates are the tallest in the country. It really is amazing, as is its fellow the Bingley Three rise. No windlass needed for the three rise as the ground paddles have the big levers attached and the gate paddles, cloughs (is that how you spell it?) 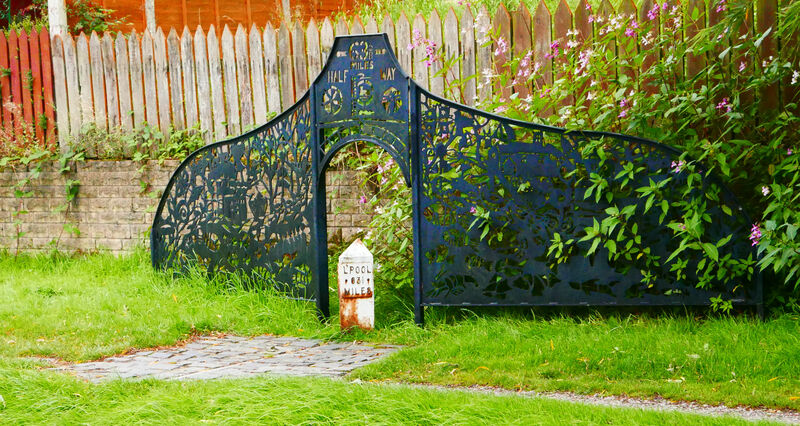 are ones that move across rather than up and down the gate (or door as they say on the L&L) . We will then be moving off above Keighley (pronounced Keithley) where in 1952 there was a large breach that washed away 4 holes of the golf course and washed a work boat into the gap. 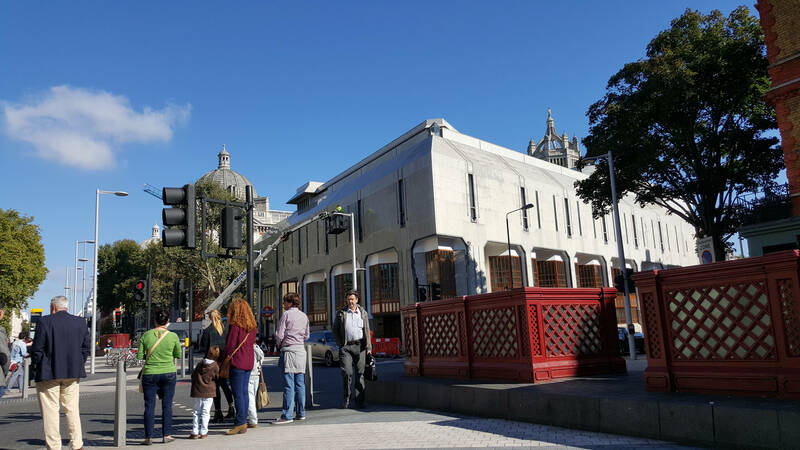 Only took 3 weeks to repair, but as they were about to re-open vandals caused more damage delaying the opening by 3 days, it was ever thus. It dropped the Skipton pool , 17 mles long, between Bingley and Gargrave by some 2 foot, a lot of water! Lovely views along here and we see and here the Keighley and worth railway, super. 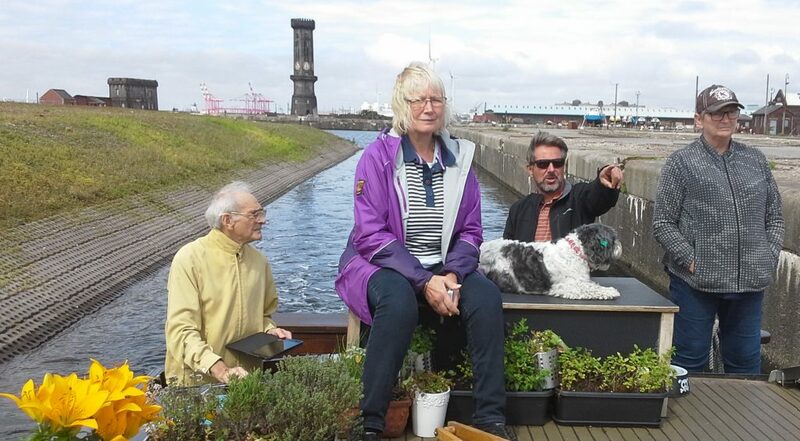 Well as ever our trip into Goole docks was great and such a different experience to regular canals. These are huge ships and some of them are only sea going whilst we have met some of them on the Aire & Calder, a bit scary! I have also played around with the camera a bit, apologies if you dont like the effects but I thought them fun. Then a bit of a shocking interpretation of colour and highlight. 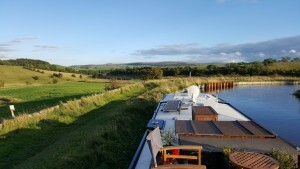 Well a load of pictures for this post, as a hotel boat we do get around a bit. 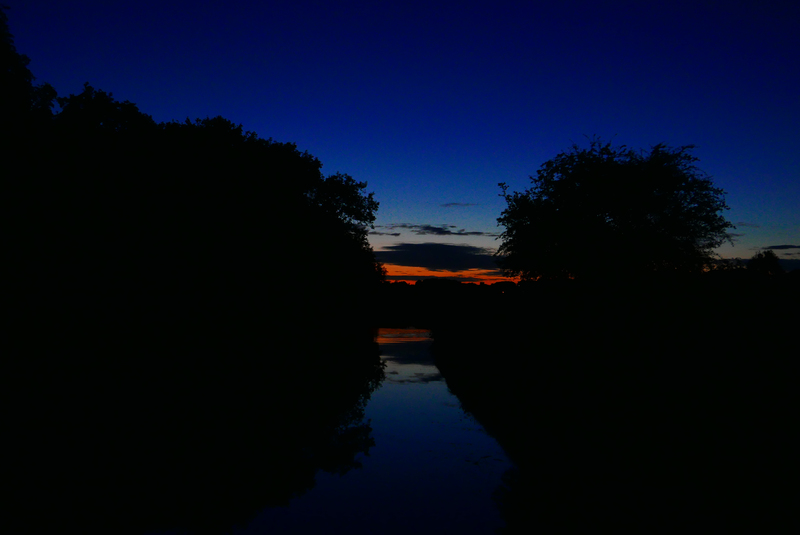 Not a sunset this time but it was actually a long exposure at night on the New junction Canal heading toward Doncaster. A lovely “new” canal. It was probably the last commercial canal dug, completed in 1905. 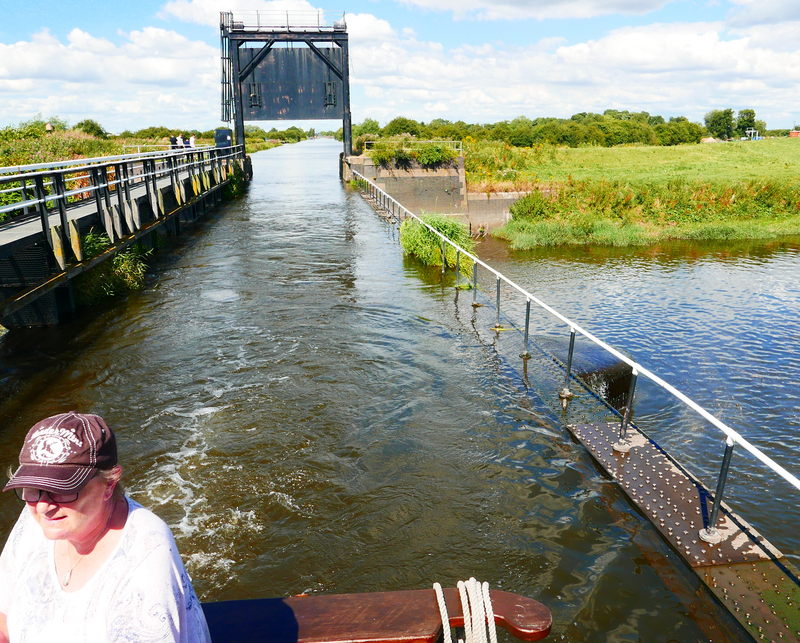 One lock, with swing bridge in the middle, and a bucket load of lift bridges, so you cant hurry, oh one swing bridge as well, just for good measure. 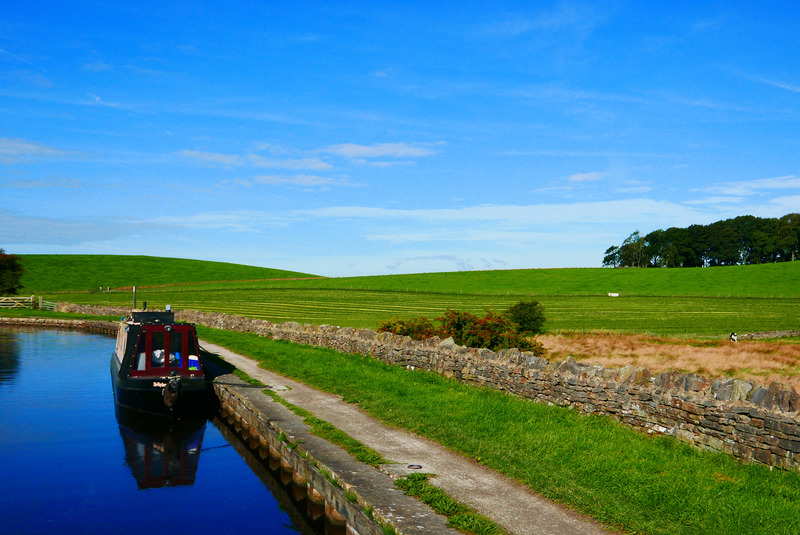 The River Don Navigation is also lovely with little villages and big views. At one of the lift bridges we met Freda Carless, built in 1964 she carried various cargoes under the ownership of Flixborough Shipping. See her entry on the National Historic Boat Register, sorry ships. Owned by a lovely couple who really do continuously cruise with her, quite a sight and they skipper her really well. Then the wonderful aqueduct come weir, look at the sides of it, over the Don. Guillotines at each each end, so careful about losing your head as you cross (sorry about that). They guillotine gates are they so that if the river is in flood it flows over the aqueduct and stops it flooding the navigation. Right guess I had better get back to polishing the boat, a hotel boat owners work is never done! Well a whole different set of sunsets for Lady Teal tonight. We have been down the lovely under used Selby canal and peered into the tidal Ouse, we then turned and ran back to the Aire and Calder! 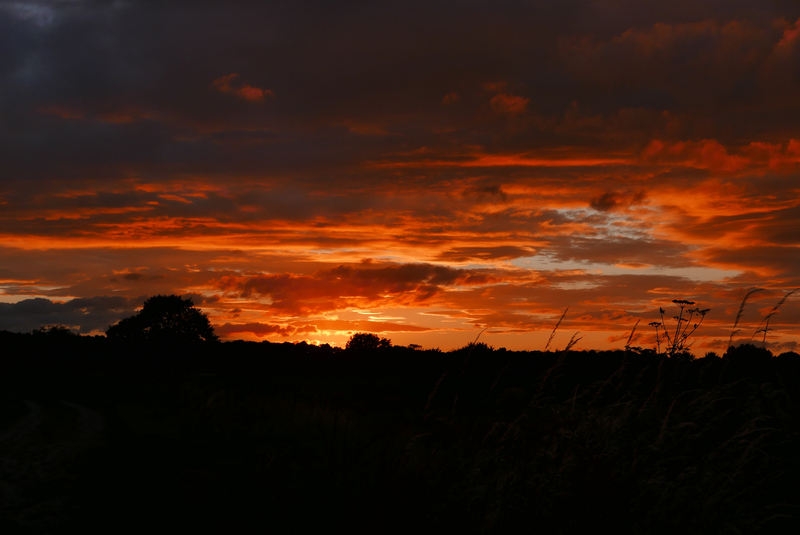 Lovely evening and an amazing rural sunset. Even the most strange place can look great at night. Night time shots seem to soften things and add mystery or romance. 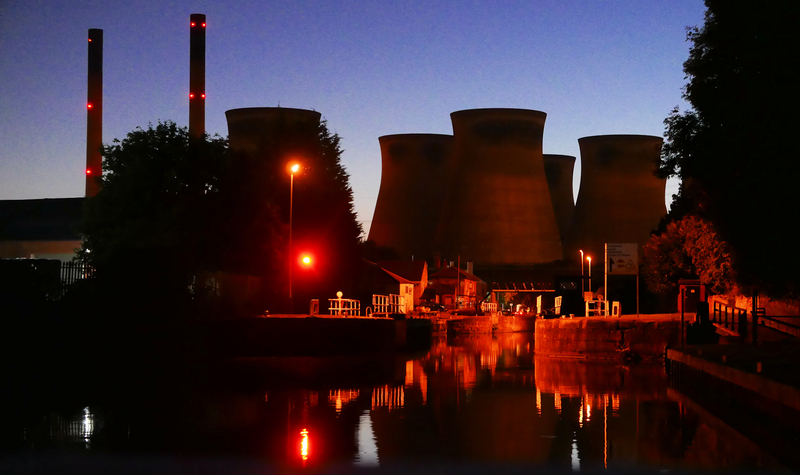 Here is a night time shot of Ferrybridge flood lock on the Aire and Calder. I guess it may be a picture that may not be possible for a lot longer. The main power stations were coal, thats why they were here. 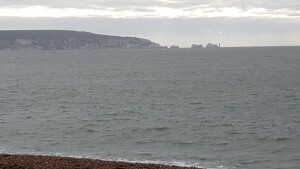 Delivery of coal was in tom puddings, trains of 40 ton barges that were lifted right out of the water by the mechanism and tipped out, incredible. By all accounts the people who drove the barges that pushed or pulled the long strings of tom puddings used to make them dance and weave along the Aire and Calder, pretty terrifying if you were coming the other way! 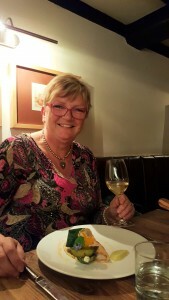 Well we are having a short break between cruises in the middle of Leeds, and celebrating being a year older! 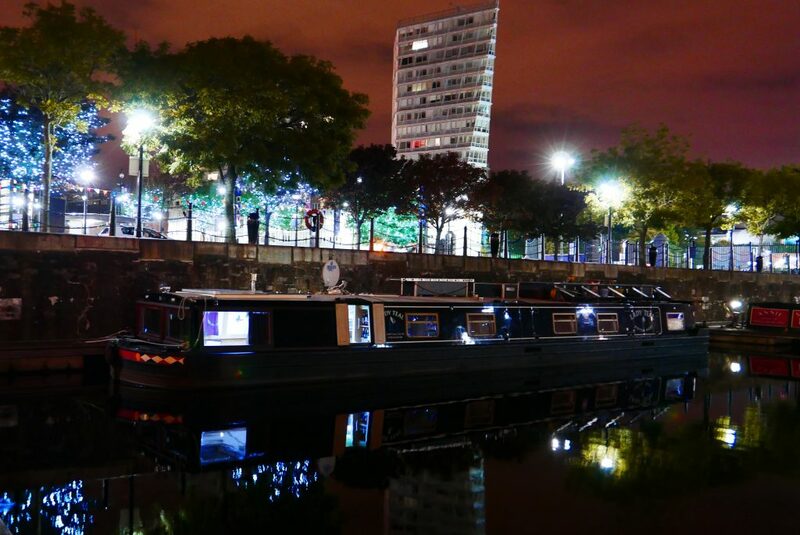 #chichotelboat #hotelboat it is a lovely spot, the vibrancy of the city and the buzz, but out into the countryside tonight. 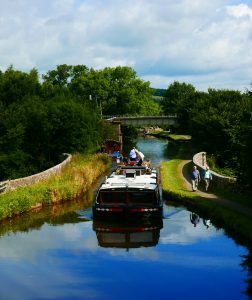 Really good video from #CRT on the bicentenary, some great quotes about the canal, with which we obviously agree. 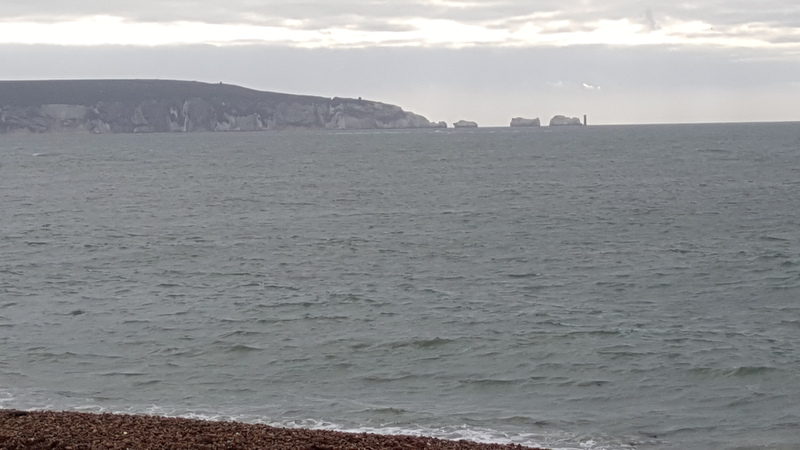 Follow this link for the bicentenary video , worth a watch. Must start embedding youtube videos, technical task to look into. 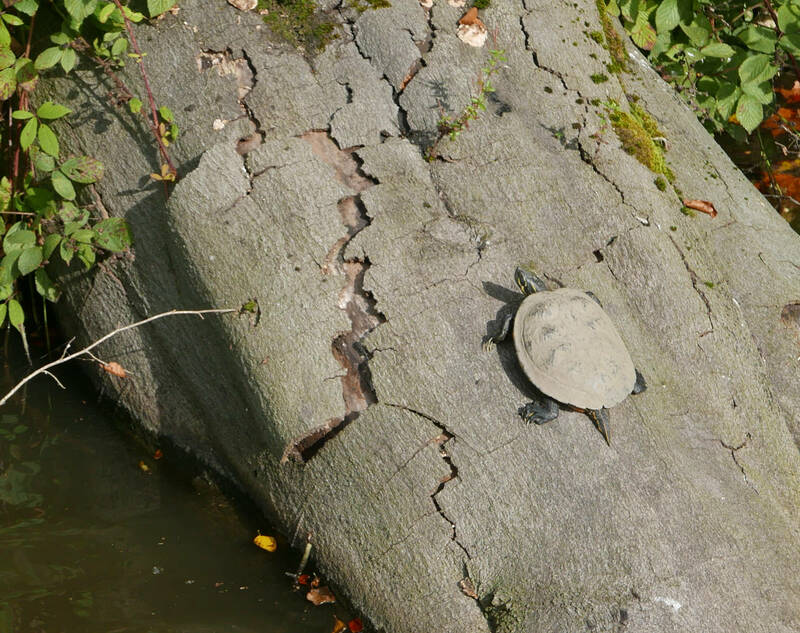 It is quite interesting, well I think it is but Gina says I am just a canal geek, that the original estimate for the canal is about the same as what it cost us to put Lady Teal in the water. Though they over ran their budget by a lot more than us. 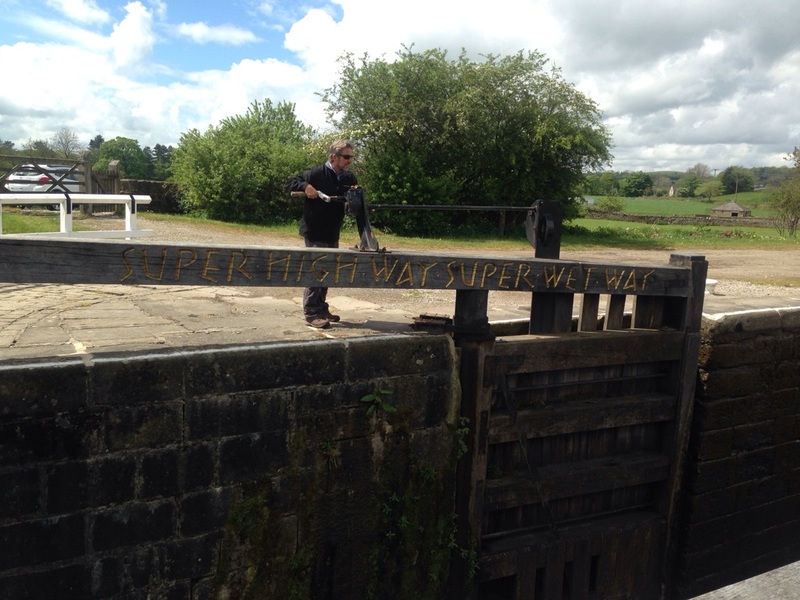 We will be moving off the L&L onto the Aire & Calder, so big locks, mostly push button for the next few days. 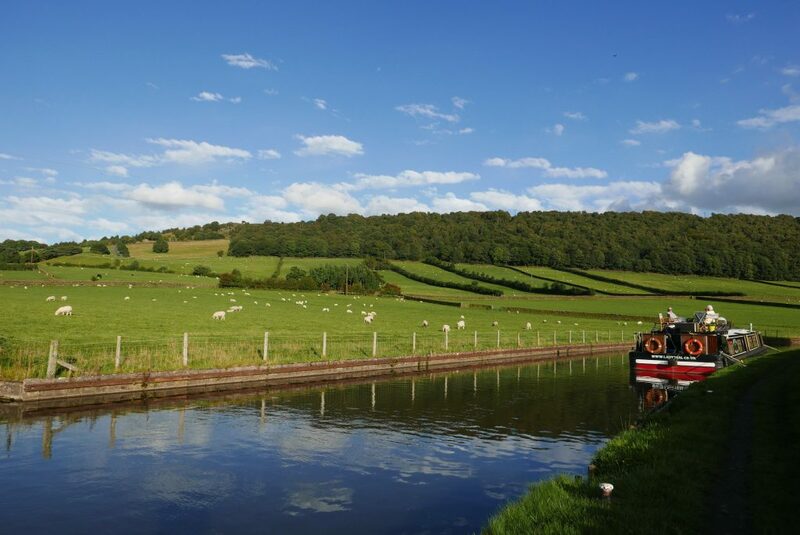 We are so lucky with the great views and scenery up here in the north,I really do think the Leeds Liverpool is a canal with views like no other, ok I am biased! But it journeys above the countryside opening up fabulous views across huge vistas in Lancashire and in Yorkshire. We do like this as a place to stop. 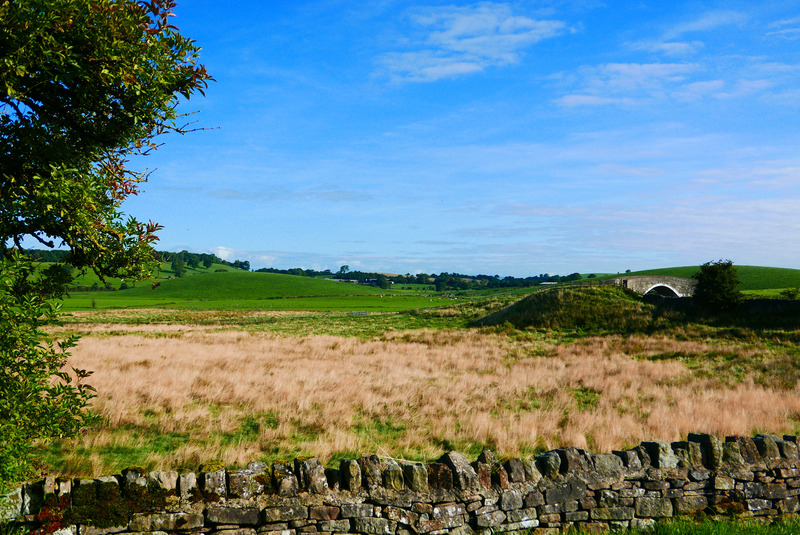 The views of the drumlins, look it up, are brilliant and it is such a great spot. Having just dropped down from the summit pound it is down hill to Leeds from here. But certainly not with the views and places to see. The wonderful Yorkshire dales and towns a villages, we are lucky to be doing this. Can’t recommend this program enough Nairn Across Britain is on BBC Iplayer and shows a journey from Worsley to Leeds, absolutely fascinating. Give it a try, for those that have done some of this you will be amazed how it has changed. A bit slow and droll but well worth half an hour of your life. 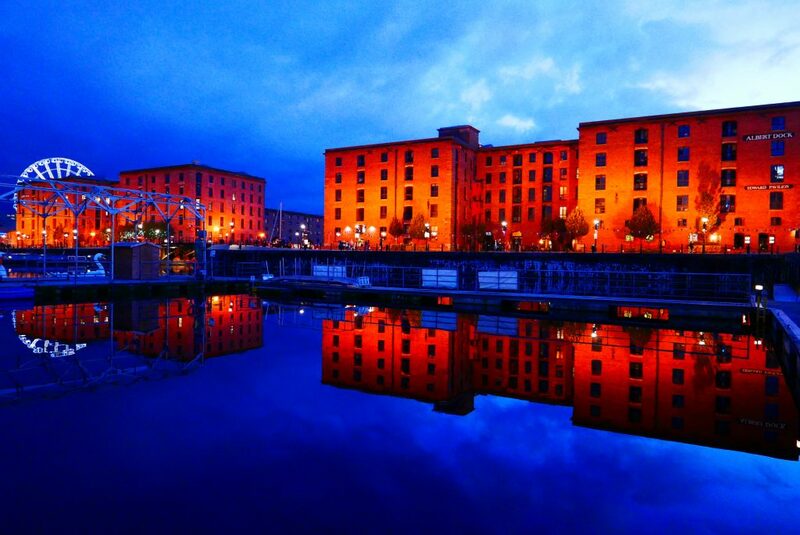 Liverpool is really brilliant, I know I say it every time but there is truly nothing else like it on the network. 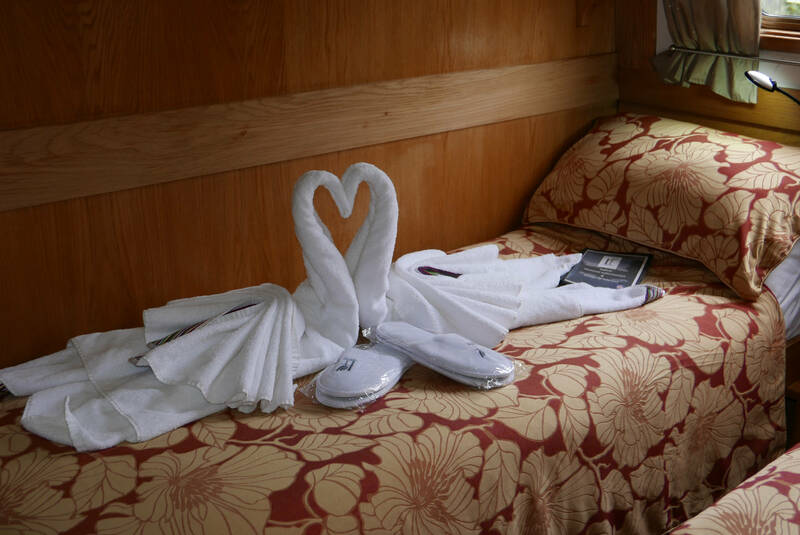 #HotelBoat loves coming coming here. 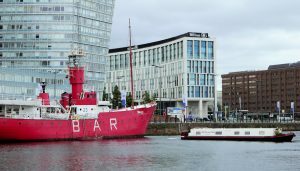 Leaving early in the mooring the wait in Canning is great fun, looking at the Bar lightship and the views of sailing boats and the super liverpool architecture, old and new. 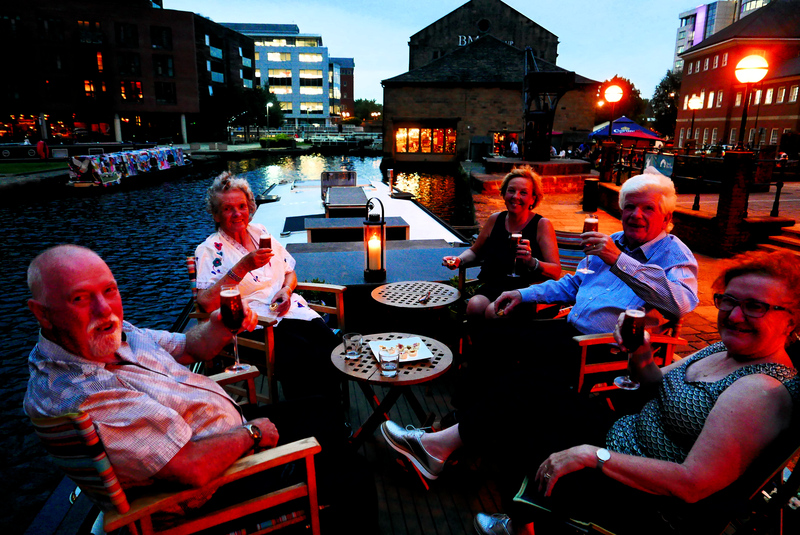 As a hotel boat we are so pleased we have been able to introduce so many people to this great city. Can’t recommend it enough. 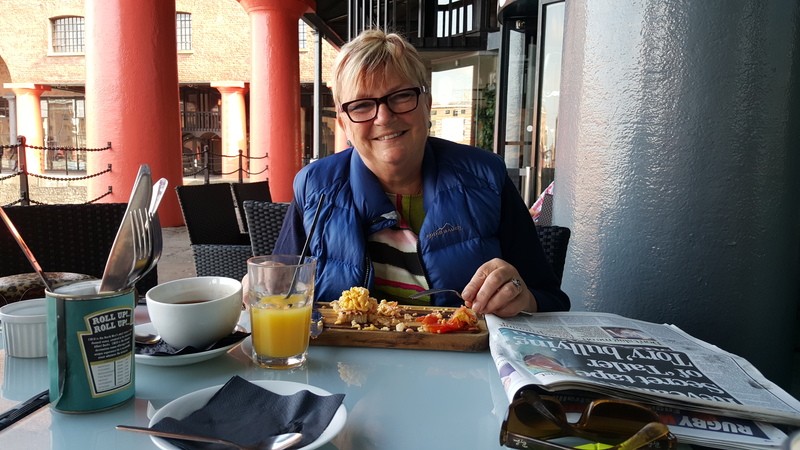 Our guests who are on now stayed at the Titanic hotel near Tobacco warehouse and adored it, it does sound a really good hotel to stay at in the city. Glen, who helps us out, and her husband Ian have been stalking us in their boat, the Dog and Ferret, and here is a shot of them with a sail ship and by the Bar. 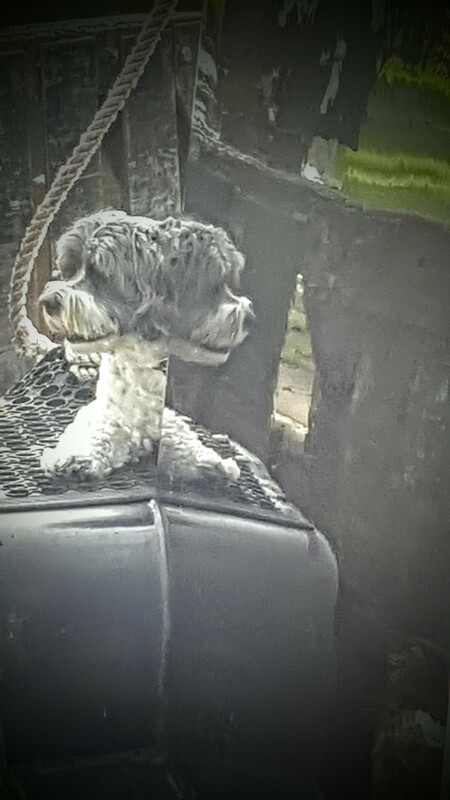 It does look a bit like the Dog and Ferret has masts! 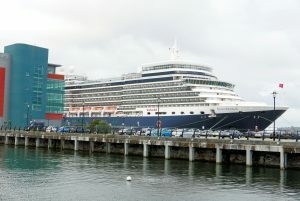 We were also lucky that the Queen Elizabeth came in the day we left so we passed close by to her. Great trip into Liverpool again. It is currently undergoing conversion, a huge job. 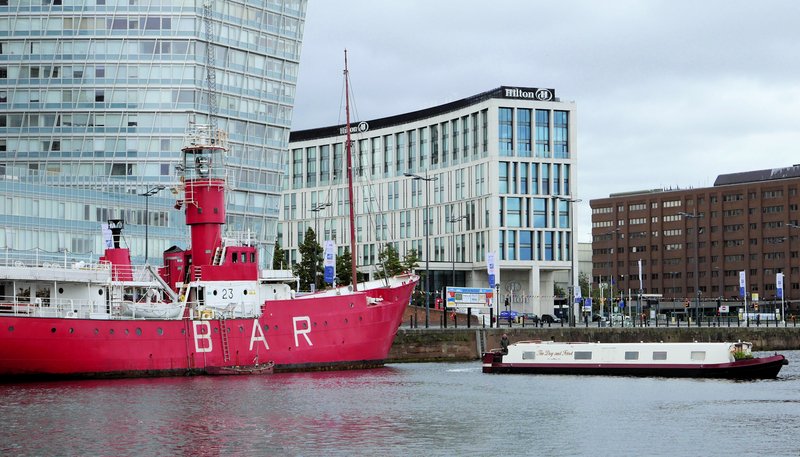 The brilliant Titanic Hotel just across the way. We are being shadowed by Glen and Ian in their boat as we make our way across to Livepool. 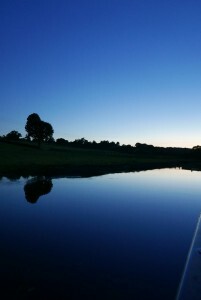 Moored last night by the lovely Pennington Flash, just outside Leigh. Really lovely spot. Wow what a fab day. 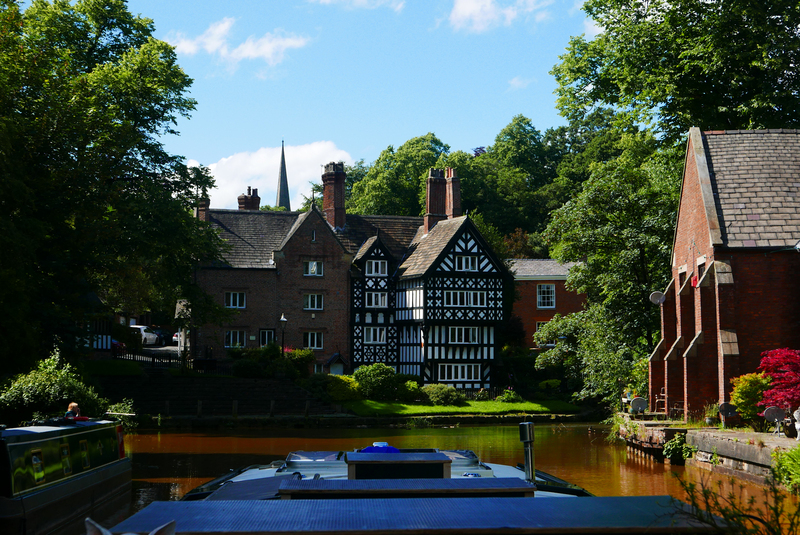 Lady Teal made her way down into Worsley, the sky was blue and the sun was shining, true hotel boat weather. Well enough of that. 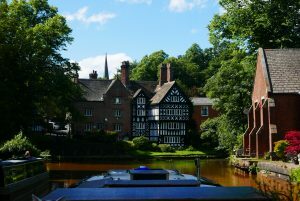 Worsley is really incredibly interesting but why oh why does somebody not sort out the Delph? The Delph was where the starvationer boats came and went from the mines. So called because you could see their ribs. There are something like 48-52 miles of underground waterway in the mines, in quite good state by all accounts. There were also two locks and an incline plane raising boats around 160 foot, so quite something. Unfortunately when last checked there was too much methane to be able to open them up to boat trips, a shame. the Delph is very overgrown and it would not take a lot to at least make it more presentable. I know there were plans to do a lot more but I guess spending cuts have affected that. Some good stuff here at a mining site Link and a great piece on Youtube actually down into the mine. 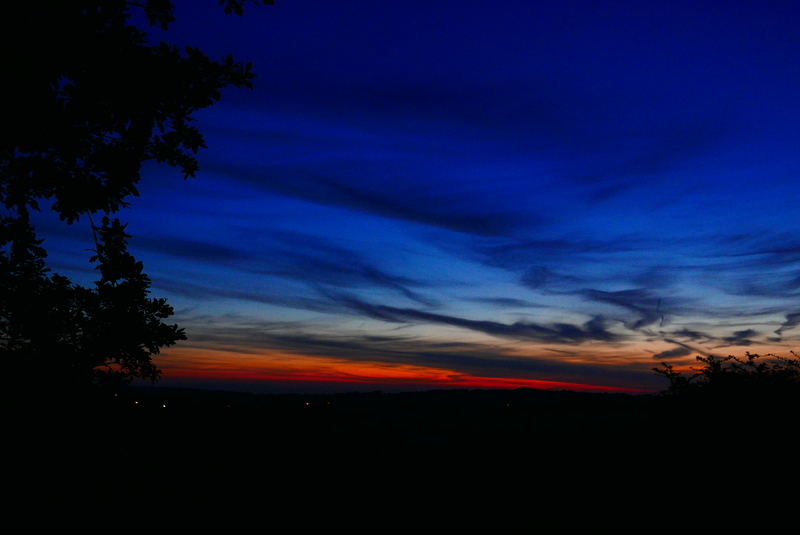 Then the day ended with a glorious sunset, who could ask for more. This is a hidden gem in Wigan. An amazing steam engine maintained by a great guy, Bill. #TrencherfieldMill #Chichotelboat. 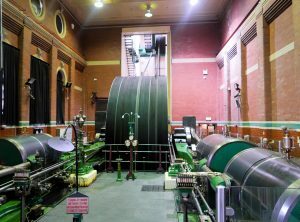 The engine house and engine is great, unfortunately not in steam when we visited. Wigan wake up and market this and open it more regularly. Trencherfield Mill should and could be such a tourist draw to the Wigan pier area, as it used to be. if you are visiting Wigan on a Sunday look up the times and go there it is brilliant! Bill does a great job looking after it and has an apprentice and a work experience guy helping out, so it is also great for them. 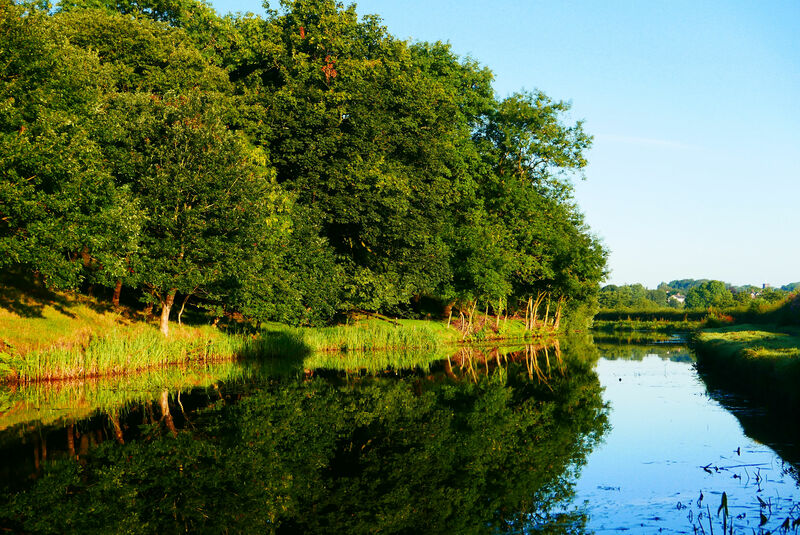 The Desmond Canoe trail from Merseyside to Humberside will utilise the Leeds Liverpool canal. 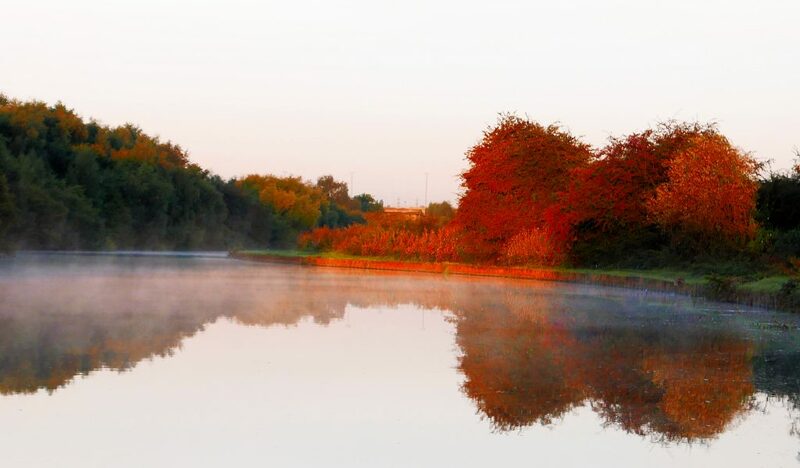 The trail, the longest of its kind in the UK, will stretch for 150 miles connecting Liverpool to Goole along the Leeds & Liverpool Canal and Aire & Calder Navigation. 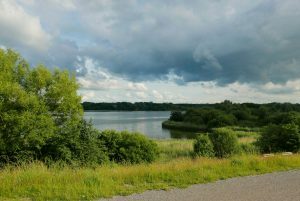 Travelling through Wigan, Blackburn, Burnley, Leeds and Skipton it will take the average paddler between five and seven days to complete., all thanks to a £1.3m donation. Not sure this canoeist got it quite right! So good to see so many boats heading to Liverpool. 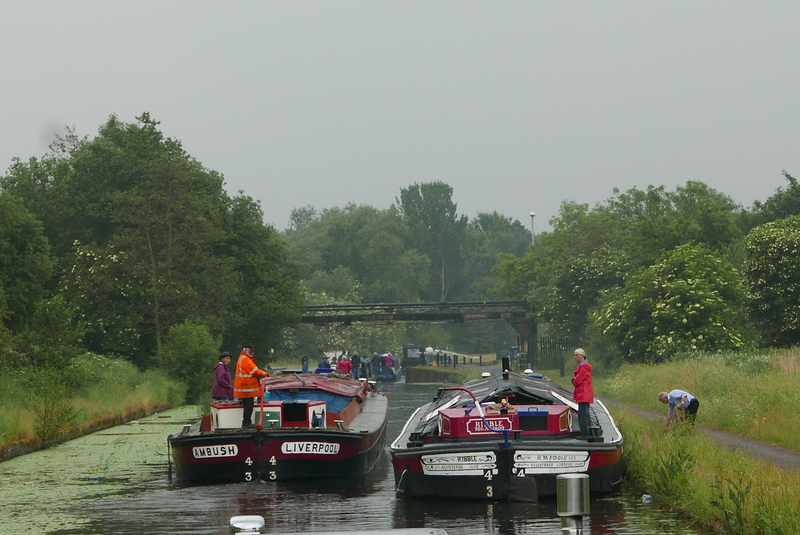 We were proud to share the route in with two historic boats, Ambush and Ribble. 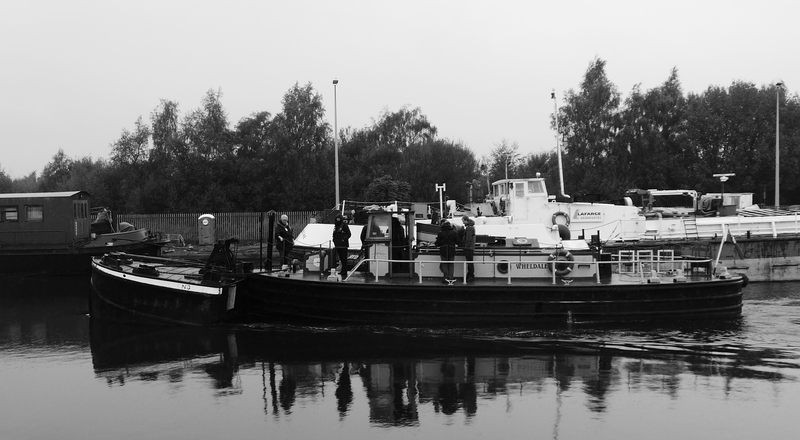 AMBUSH is a Leeds and Liverpool longboat, a narrow boat of steel plate construction with a Gardner 41W diesel engine. 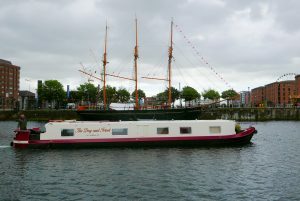 She was built by W J Yarwood of Northwich in 1933. She was built and worked for H R Ainscough. 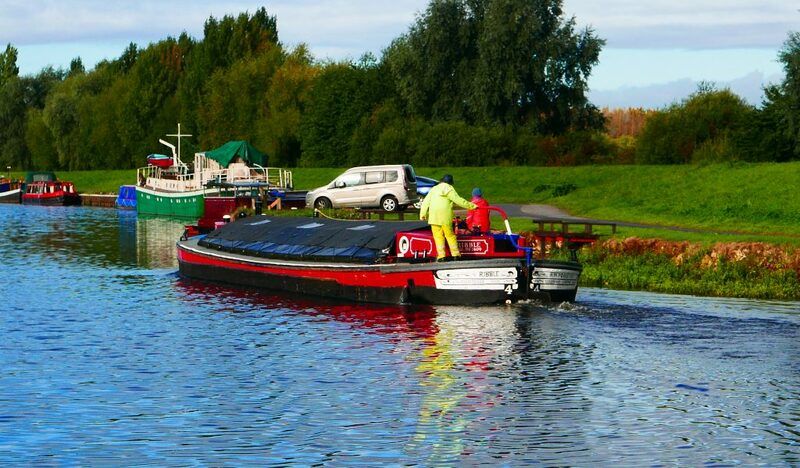 After trade finished, she was used to carry coal to Westwood Power Station in Wigan and later was turned into a trip boat in the Liverpool area. 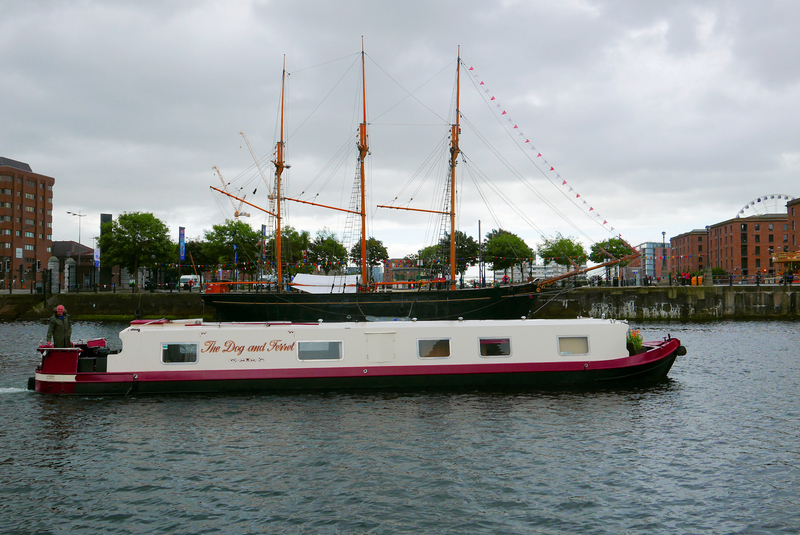 AMBUSH is one of a small number of Leeds and Liverpool long boats and in 2011 was under full restoration by her present owner. 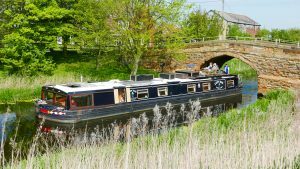 Ribble is a 1933 Leeds Liverpool short boat. Basically short boats were 60 by 14 foot and long boats 70 by 14 foot. Sometimes the flyboats were narrower. Above Wigan only the shorts could operate, due to lock lengths and curves. 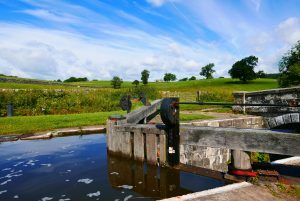 Thought was given to lengthening the locks around the end of the 19th century but it was going to be too costly and complex. Also comment was made that the locks at Johnson Hillocks were poorly made, unusually as most of Rennies builds were excellent. Two little videos of Appley Lock on the Leeds Liverpool canal. Lady Teal, five star awarding winning hotel boat going through. 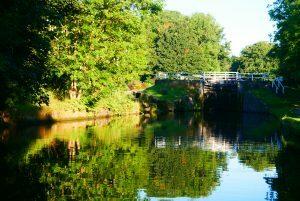 This is the original deep lock that used so much water a new cut with two shallower locks and a pound for boats to pass was built. 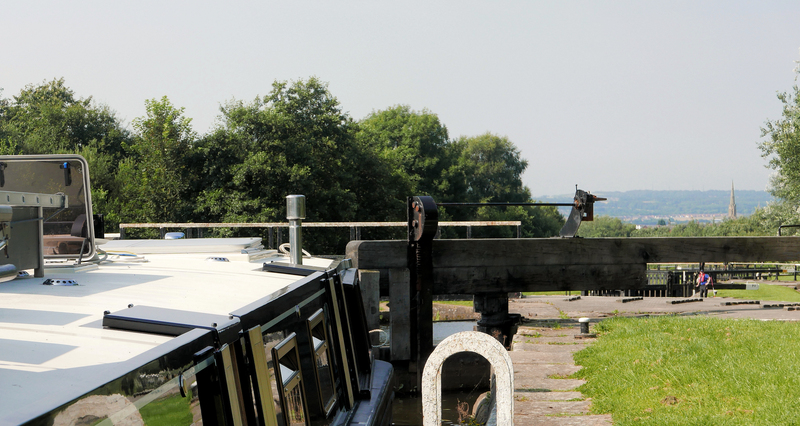 They are now in a state of disrepair so only the depp(12 foot) lock is now operational. 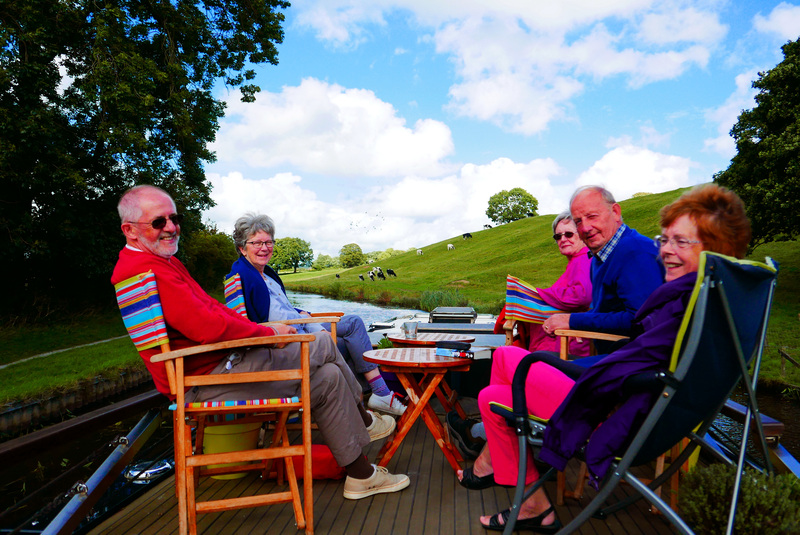 Unusually we have late availability on a twin on the Panoramic Dales cruise 11-15 July, from Reedley to Skipton. We very rarely do this but we have decided to offer a 10% discount on this cruise. It is sold on a first come basis, please call or email if you would like to book. What fabulous weather we have had the last few weeks, culminating in this Lazy Sunday Afternoon! It has been truly extraordinary. Six weeks ago snow then weeks of lovely weather that just keeps on giving! Lovely picture off Holme lock Gargrave courtesy of Glen. Gina not too sure about the cost of the art project writing. The lovely Aire Valley and Gargrave, and what is that sheep up to! 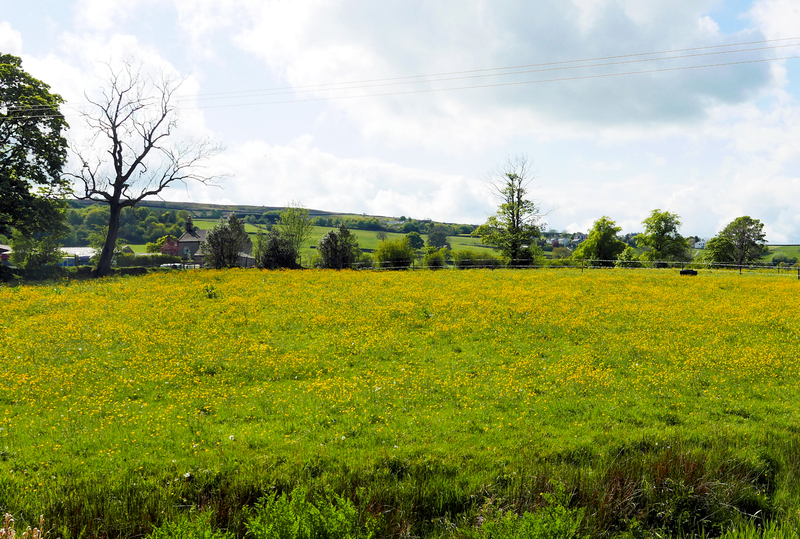 A lovely day through the Aire Valley and Gargrave today. The scenery really is stunning and the village is brilliant, so typical of the dales, great views and stone cottages. 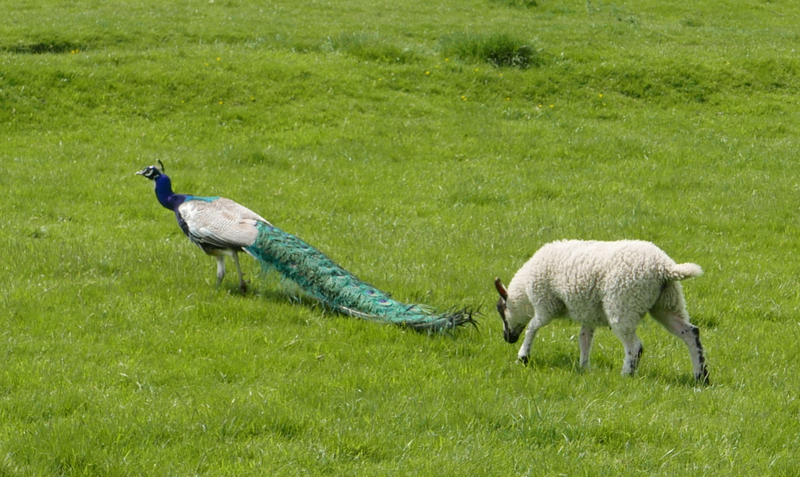 There is also a Peacock in the sheep field, not quite sure why the sheep was following it around though. Unusually we have had a late cancellation for a twin on our Fab Four cruise 6th to 12th June 2016, between New Springs and Liverpool, the standard cost is £1025 per person, or £1538, for single occupancy. As this is a late, and unusual, cancellation we are happy to offer a 10% discount for this late booking. If you are interested please call or email, we will book the cabin on a first come first served basis. Payment of the full amount due will be necessary to secure the cabin. Is it just up here in #Yorkshire or is it the year of the buttercup? Every other field seems full of them , a really lovely show. It seems to happen every few years one flower takes over. The other great thing about this time of year is all the young. 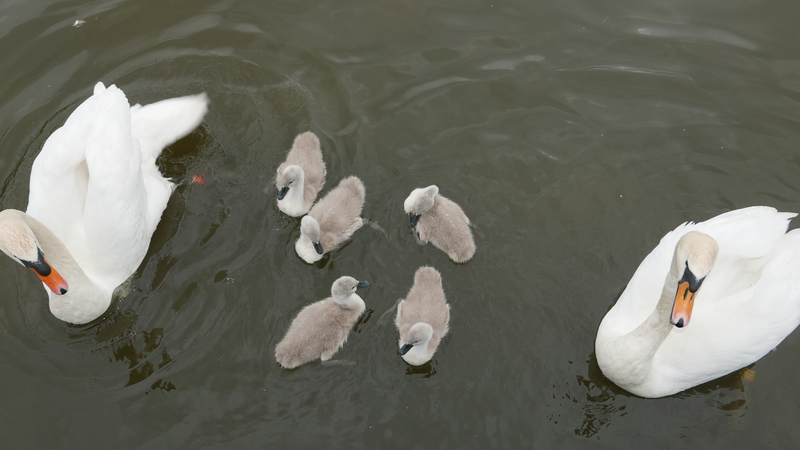 We saw a great flotilla, that the right word, of goslings today. Lots of “ah how cute” comments! Tim and Pru West are filming #GreatCanalJourneys on the Leeds Liverpool and were at Bank Newton yesterday. 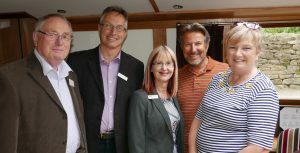 Great to have them filming on the longest single canal in the country, the Leeds Liverpool, yes I know the Grand Union is longer but it is a union of canals! 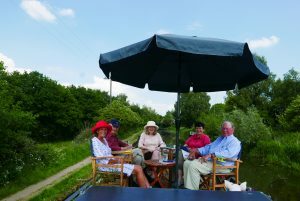 It is particularly good as it is the bi-centenary year of the opening of the canal. 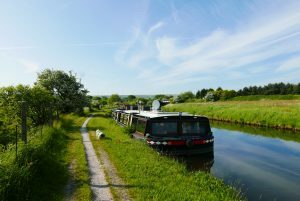 Leeds to Gargrave and Liverpool to Wigan were opened many years prior to 1816 but shortage of money and the Napoleonic wars saw the completion of the canal stalled till 1816. 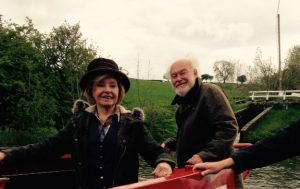 They really are a lovely couple and the Great Canal Journeys programs are a super showcase for our wonderful canal system. They seem to be covering all of it, along with the pieces they have done abroad. Not sure when the program will air but will look forward to seeing it and am very interested as to what bits they will choose to highlight, beyond the obvious and iconic Bingley 5 Rise and probably the now very pretty Wigan flight. 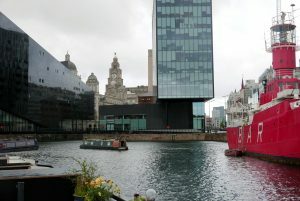 Of course the Liverpool link past the Three Graces and under Pier Head, oh I could go on and on and normally do, but we will have to await and see. They were in a hire boat this time and look to be enjoying the trip, we well know that the demands of film crews can drag out going through one lock to well over an hour, but they are hardened pro’s so seem to cope very well with all the rigours of filming. 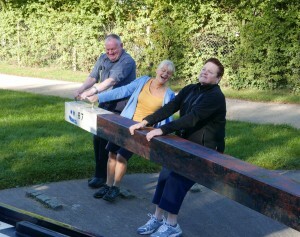 it has caused great excitement along the cut with everyone saying that Tim and Pru are on their way. interesting how we seem to feel we own celebs. so can use their first names. 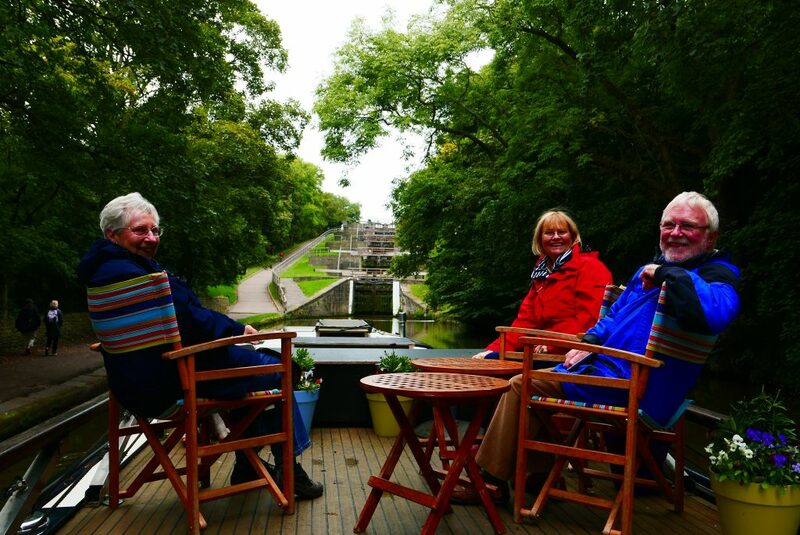 Do look out for the Great Canal Journeys program on the Leeds Liverpool, as soon as we know when it is coming out we will let you know. Lady Teal on TV again! 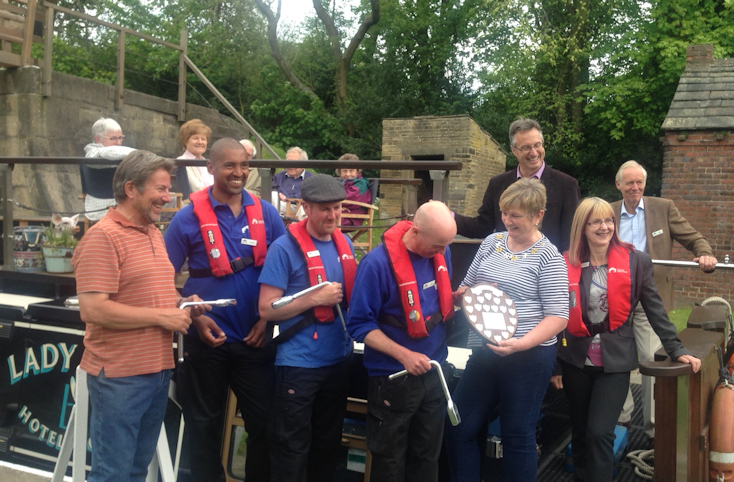 Pleased to be on BBC Look North as part of the Lock keeper of the year awards, at the Bingley Five Rise. The three keepers did great interviews, well done John, Nick and Richard. So good to see such positive TV coverage for the waterways. Though there is a lot on TV at the moment, and looking forward to Tim and Pru Wests next program. On behalf of British Marine Inland Boating Hotel Boats Lady Teal was very proud to present the Lock Keeper of the year award to John, Nick & Richard who work the iconic Bingley Five Rise staircase locks. We hosted Harry Arnold MBE (Waterways photographer & Journalist), Richard Parry (CEO CRT), Chantelle Seaborn (North West Manager CRt) & Bob Pointing (Chair CRT Northwest Partnership) on board Lady Teal. 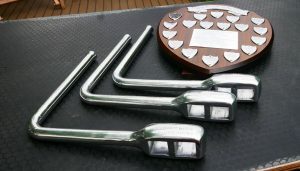 This is a very prestigious award given annually to the keepers voted for by the hotel boats. These guys are always helpful, smiling and informative, our guests love them. They are flexible and safe in their approach, who could ask for more. BBC Look North attended and did film, though we haven’t seen it yet. Definitely something a bit different for our guests, and we have never seen so many CRT keepers and managers at the Five before! These guys really reflect the customer service ethic that has always been with the guys on the ground and that CRT now clearly recognises and celebrates. 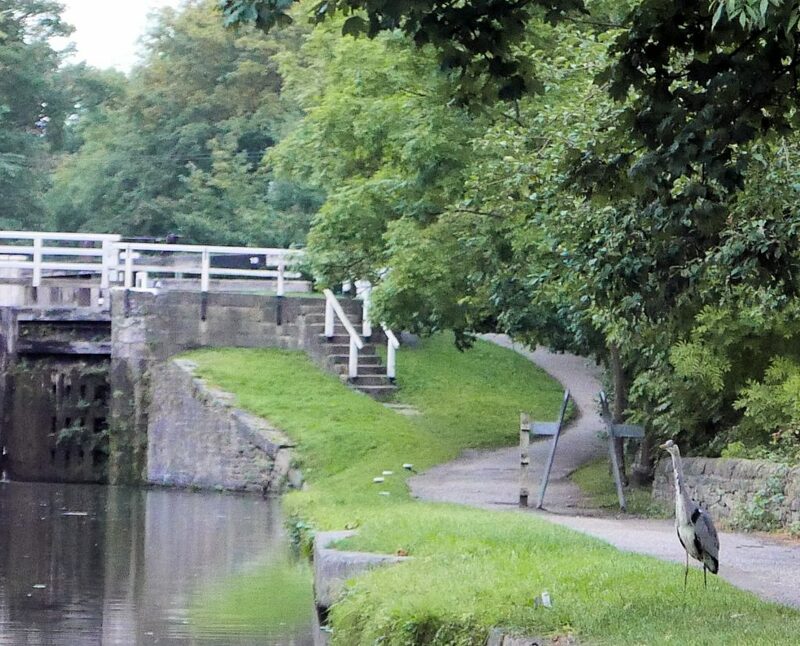 Went through the huge Lemonroyd lock on the Aire and Calder today. 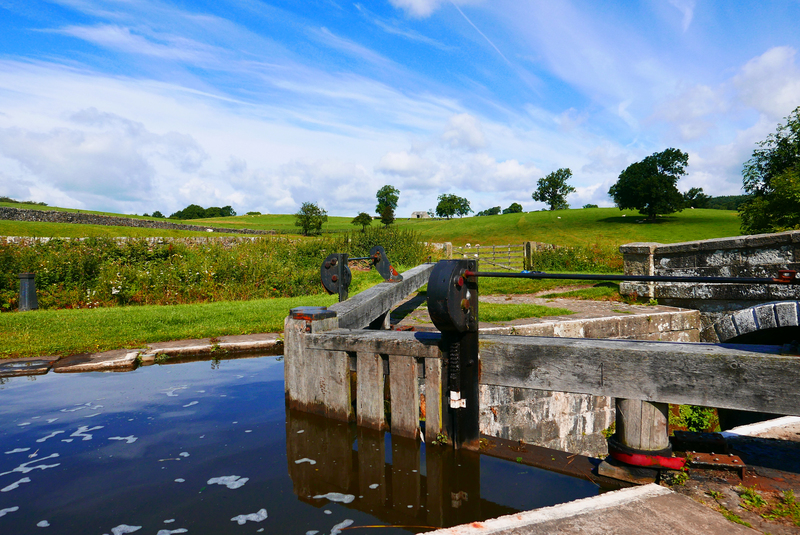 The lock, which drops 13’6″ replaced two previous locks that washed into the St Aidans open cast mine. It is designed for Euro 2 boats so is really big. 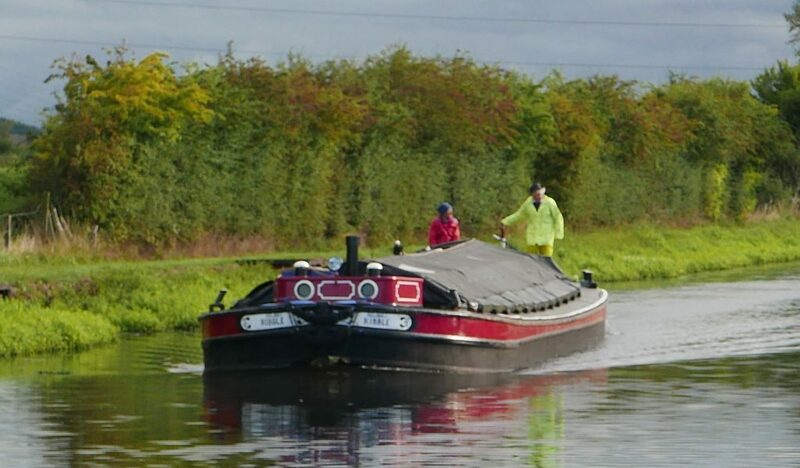 Its fun playing with the big canal toys but nice to be back on the Leeds Liverpool that is more our scale. Though I have to say it is great to be able to turn around wherever we want to! It really was such a lovely day. Bright sunshine light breeze and a great canal. 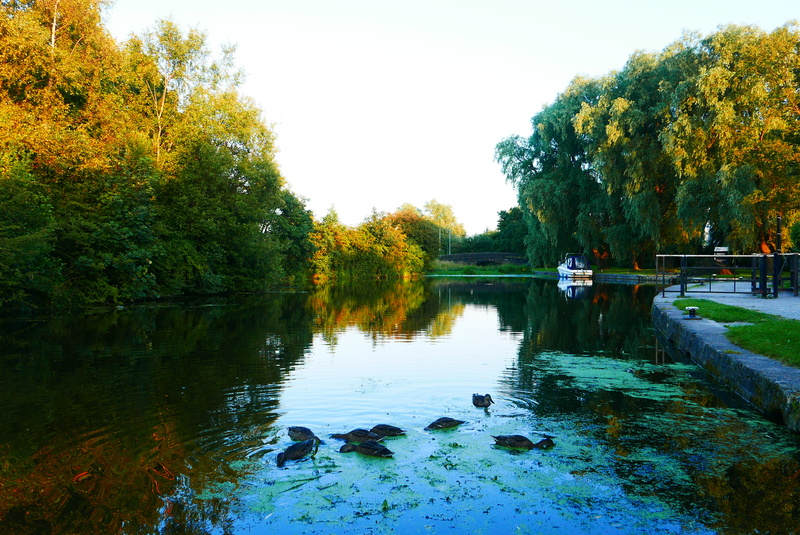 We do love the Selby canal as it has so much wildlife and a lovely atmosphere. Its bridges are great and the structures to help the surrounding land drain are quite intriguing. 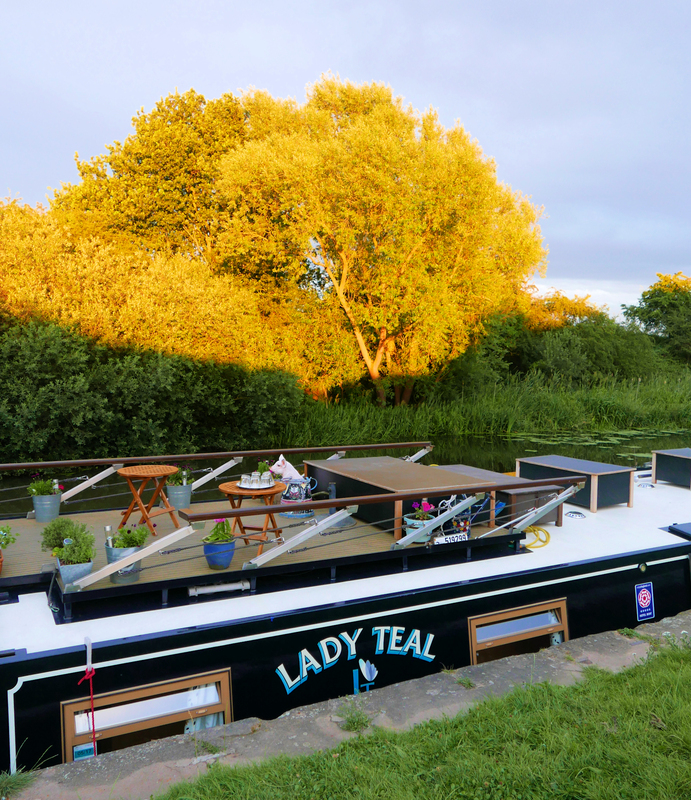 A short video here, Lady Teal on the Selby . The sound of all the birds is real! A lovely evening on the quite and gorgeous Selby canal. 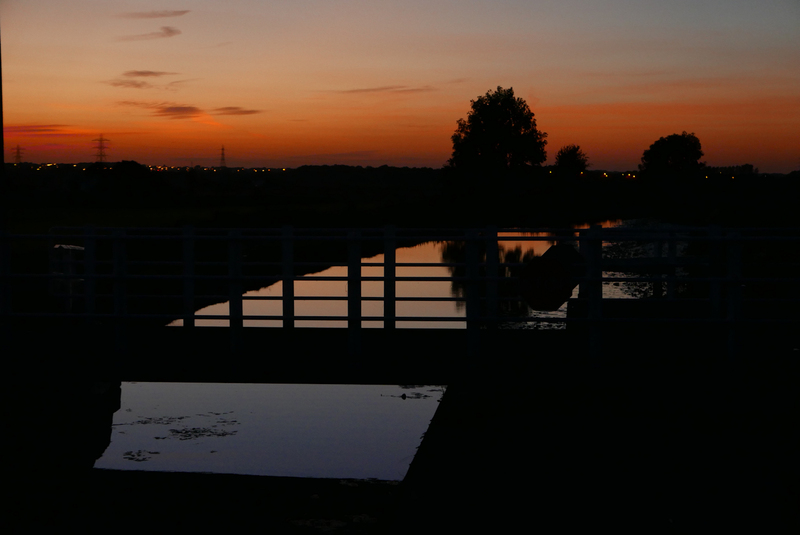 This canal really is a gem, an ends at an interesting view of the might Ouse. We moored tonight opposite a foxes set, the you were out playing and having their tea, we did not look too closely as to what it was! 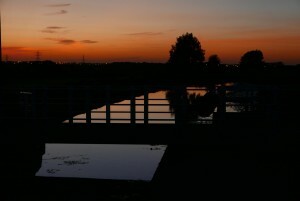 But it is a super canal with lots of history and interesting features. Back out onto the Aire tomorow. Mixing it with the big boys! Mixing it in Goole with 175 foot long 18.5 foot wide 250 tonne barges! Brilliant place for something different. 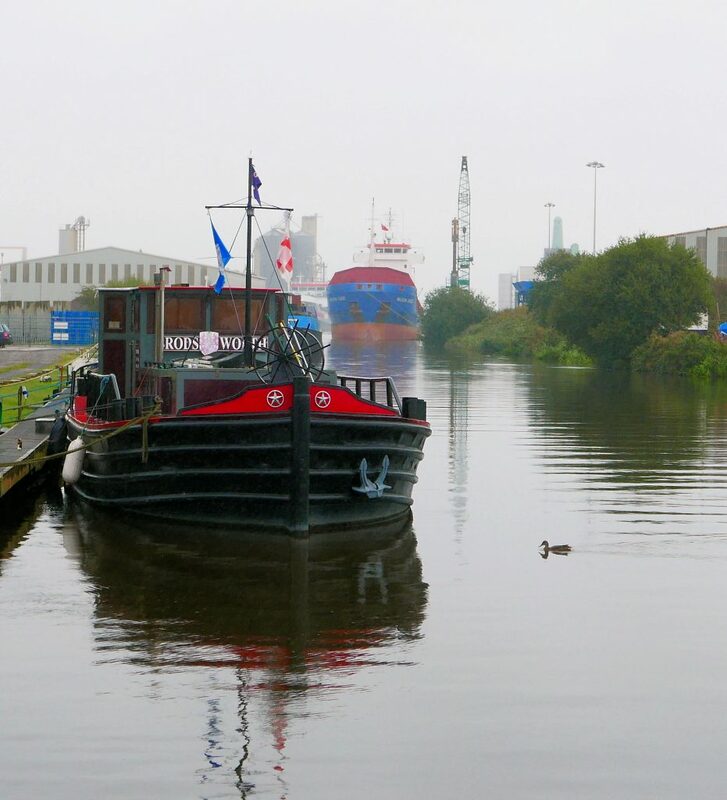 The Aire and Calder is still commercial with these large barges shifting oil, quite exciting when you pass them, or them you! Well the weather has been interesting, from snow to shorts and t-shirts in a couple of weeks! 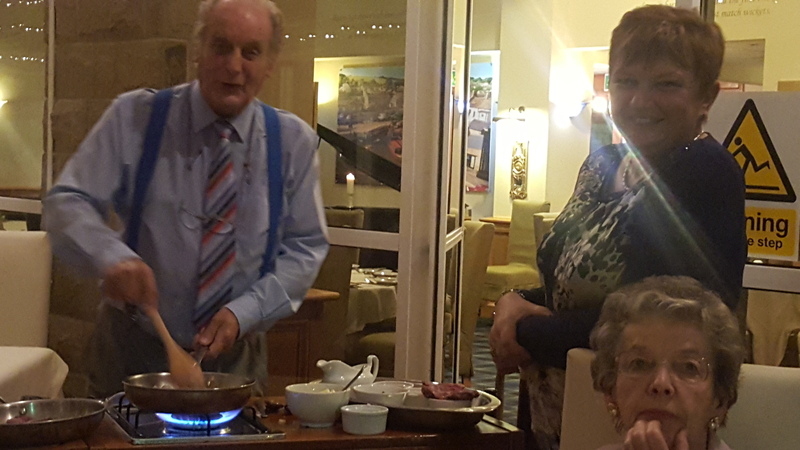 The guests loved the special Christmas cruise, though it was a surprise for us all. 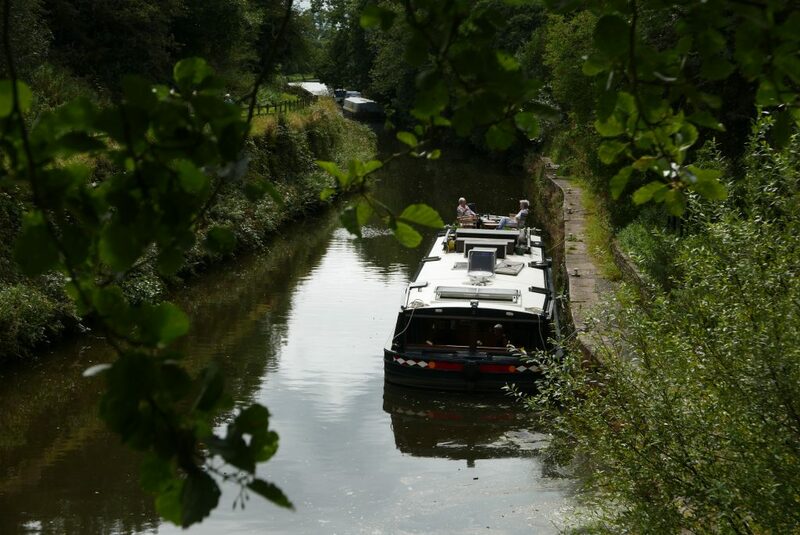 We were held up with a lock failure but it meant a cruise bonus for guests as they did the Wigan flight, or went through Foulridge Tunnel as an extra. 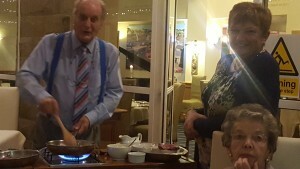 A great time seemed to be had by all. But that is why we have not been posting, long cruising days catching up on the schedule. Which we successfully did in double quick time. Have to say the unexpected mud bank in Leeds as a result of the new flood alleviation scheme and then sonic booms as two Typhoons from Coningsby chased a French jet were a surprise, all go. 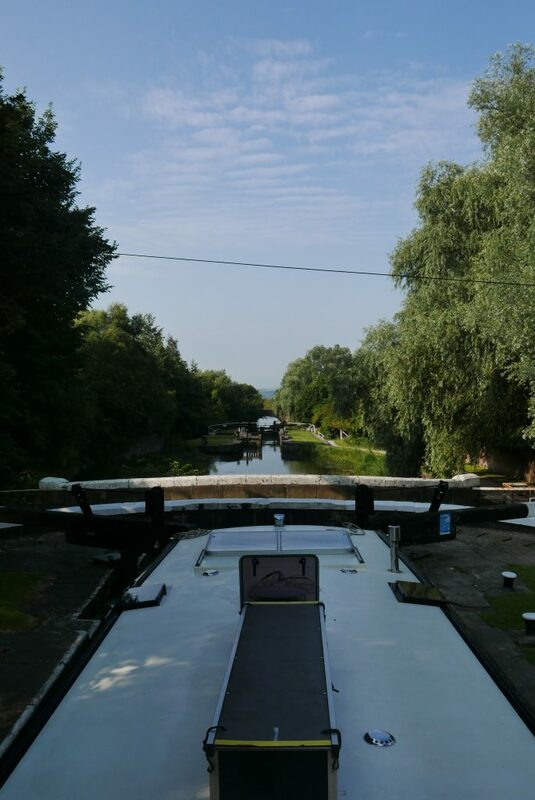 Out on the Aire and Calder for a few more days of lovely sunshine cruising! Well season underway. Have had a great trip into Liverpool and now heading across to Goole, from the tideway on the west to tideway on the east. 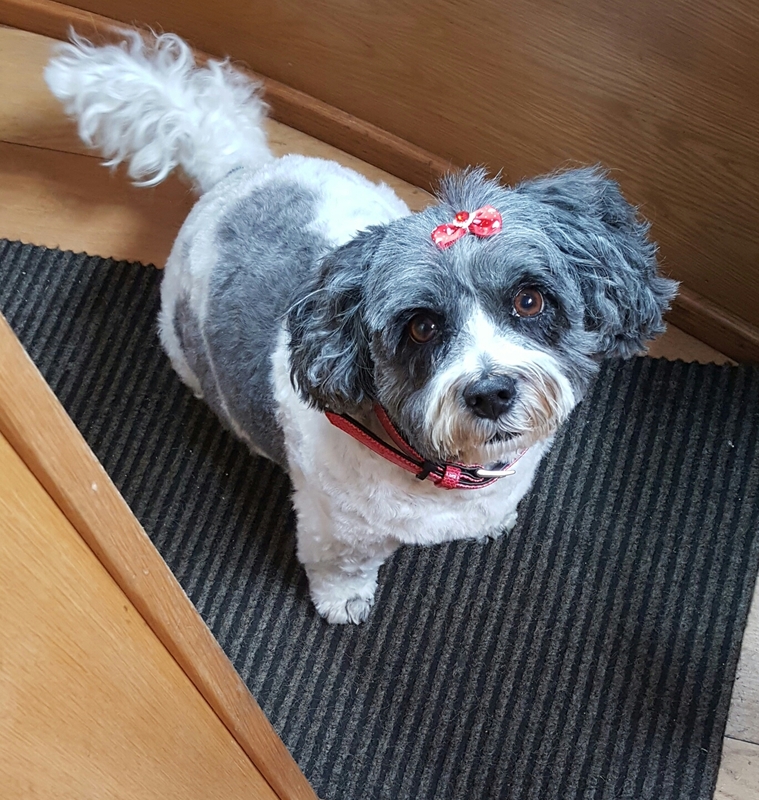 Lady has had a haircut for the trip! Well its not long till we start the 2016 season. Some new territory to cover along with the wonderful Yorkshire dales and fabulous Lancashire countryside. I was in Leeds the other day and the wonderful new station entrance with river view is now open. A few new bits and bobs for the boat and we have some decorating to do before we start. Looking forward to getting out on the water again. 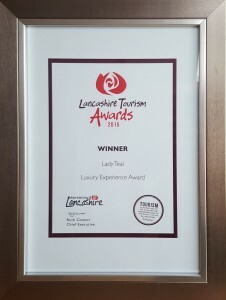 Our plaque arrived today, many thanks Marketing Lancs. 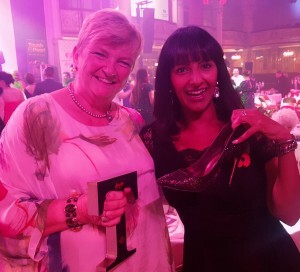 Still proud as punch to have won the Luxury Experience award. We are, of course, proud for ourselves but also for the waterways. 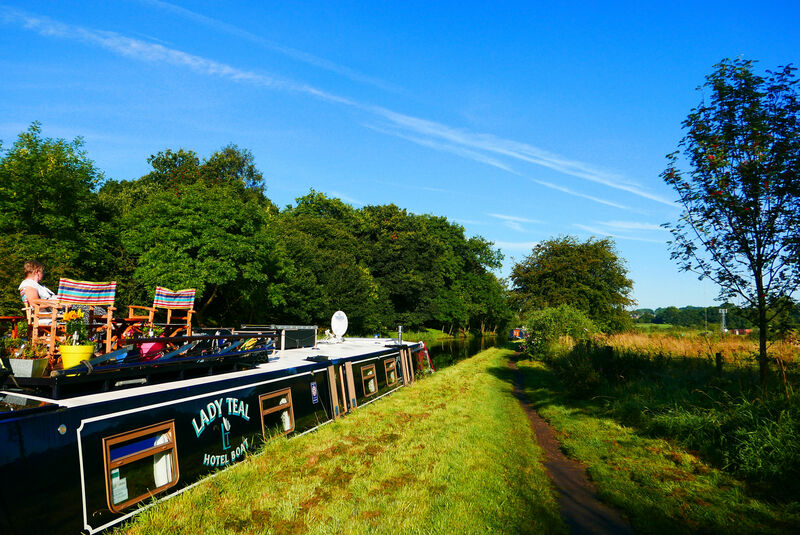 Lancashire is such a wonderful place and we are so pleased to be able to spend our time wandering it’s waterways. Obviously there has been a bit too much water in the last few weeks and our thoughts are with all those people involved. 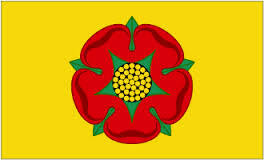 We would urge people to show their support by coming to visit Lancashire. there are many great places to stay and fabulous things to do and see. Walking is wonderful and their are many great museums to visit. @CRTComms @CRTNorthWest #flooding #hotelboat Thanks for contacting us CRT, that was very kind. Pleased to say all is well with us. Seems worse down Leeds and Aire and Calder, thanks for this picture Paul. 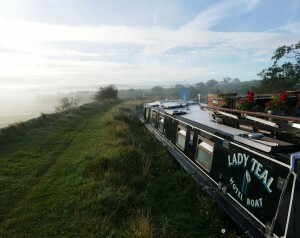 Lady Teal is good and best as we can gather so are all people on the Leeds Liverpool canal. Where the river part of the Aire and Calder navigation has over topped I should think there will be some long term clearing up. Feel so sorry for all those poor people who were flooded. 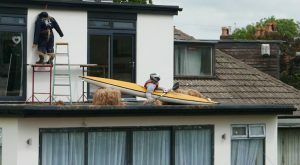 Thought the guy in York who said it was his choice to buy near the river no one made him do it was very stoic. Lets hope for a good new year for one and all. 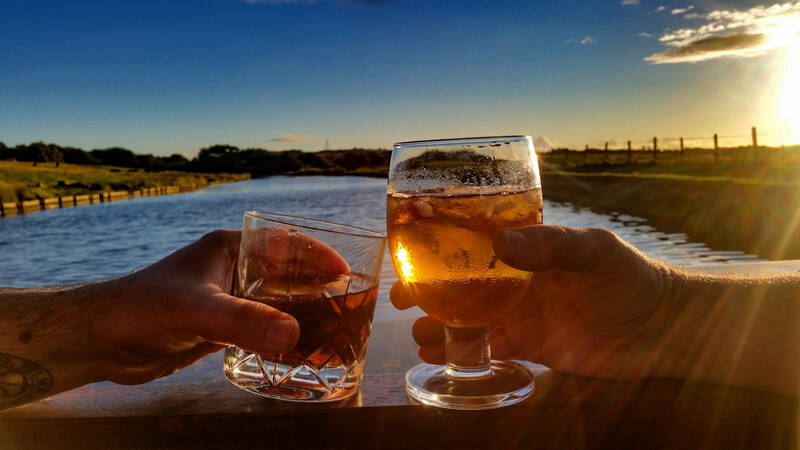 Well almost year end, our thoughts are with all those in Lancashire and Yorkshire in the floods. On a happier note it is lovely to see what some of our guests do for Christmas, amazing attention to detail! A Merry Christmas to one and all, and a happy new year from Nick, Gina and of course Lady & Glen. This year has been an amazing one for us with the highlight being the Luxury Experience Award, we were so pleased with that! But it was also a year when we went into Liverpool for the first term, amazing, and had surprisingly great weather. The start was a bit windy but we had mainly dry and, believe it or not, sunny weather, & plenty of water in the canal. CRT did a great job at managing things and we were lucky that we were not caught up in any closures, so thanks CRT. Heres to next year. 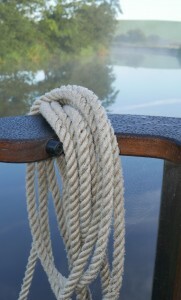 Though first we have a number of things to do to the boat! The 2017 cruise schedule and descriptions is now on general release and is booking up strongly. Come see the new cruise descriptions. 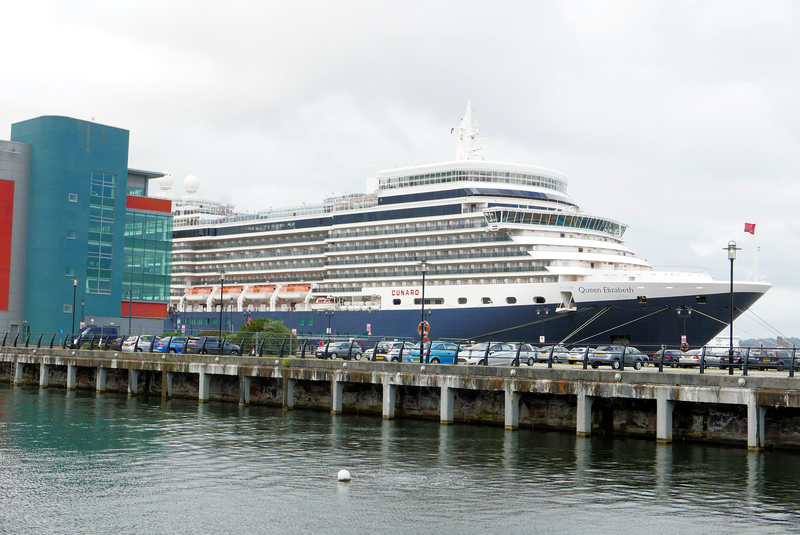 Don’t miss out on that particular cruise you want, many new cruises for 2017. 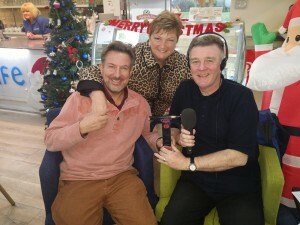 Well good fun on the radio, Gilly is a fellow award winner and really nice too! 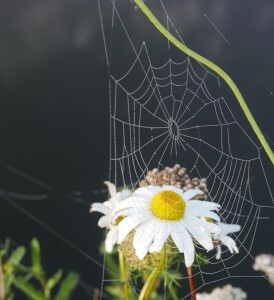 We are on the web for the next 29 days, that’s till 23 Dec 2015, http://www.bbc.co.uk/programmes/p037r1tw#play at around 3hrs 8mins 40 secs. @Gillylancs @beachcafefylde Listen up tomorrow at around 3 or on IPlayer for Radio Lancashire we will be on with John Gillmore ,Gilly, who won the Tourism Superstar award when we won our Luxury Experience Award. 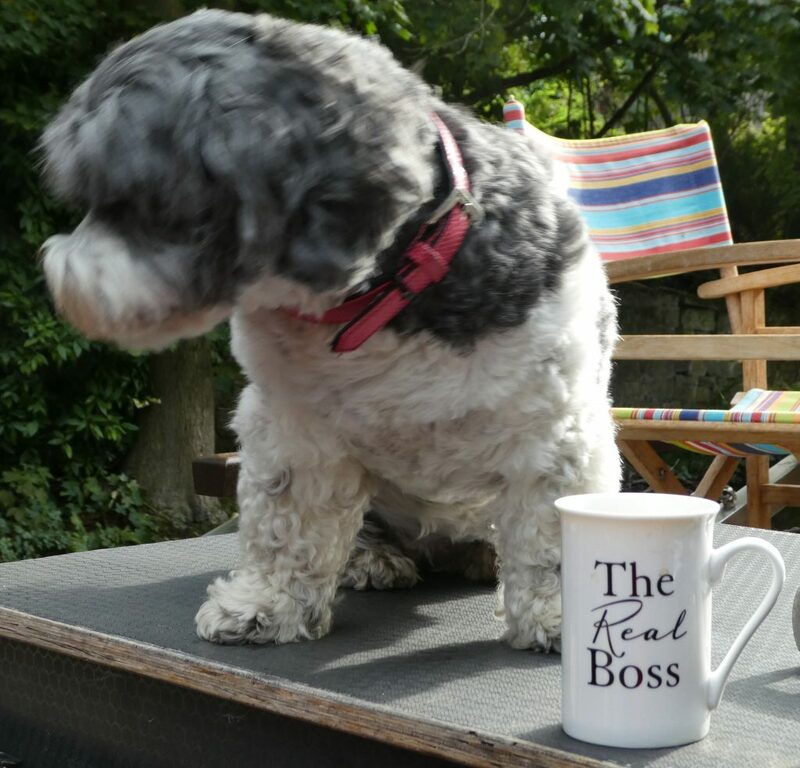 Looking forward to being at the Beach Cafe St Annes on Sea and having a stroll on the beach with Lady. Thank you so much everyone for all your congrats, we are floating on air! All tucked up safe and sound. 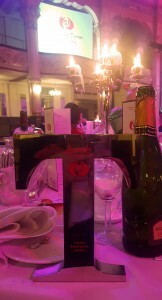 Many thanks to all our guests, suppliers, lady and of course Glenn who made this award possible. At the awards here we go. 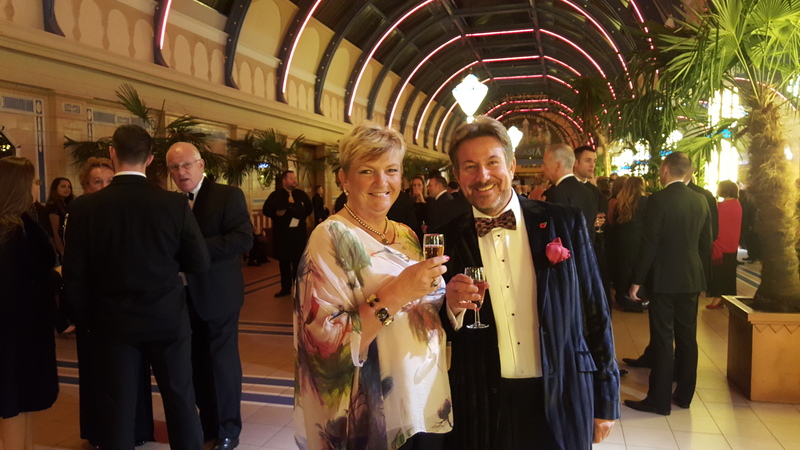 #LTA15 Lancashire tourism awards tonight. 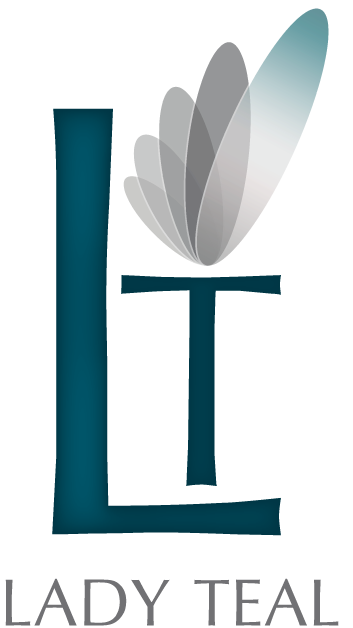 Good luck to our fellow finalists, fingers crossed for us in the Luxury Experience award. Sorting through pictures from 2015 here are some of my favourites, more to follow. 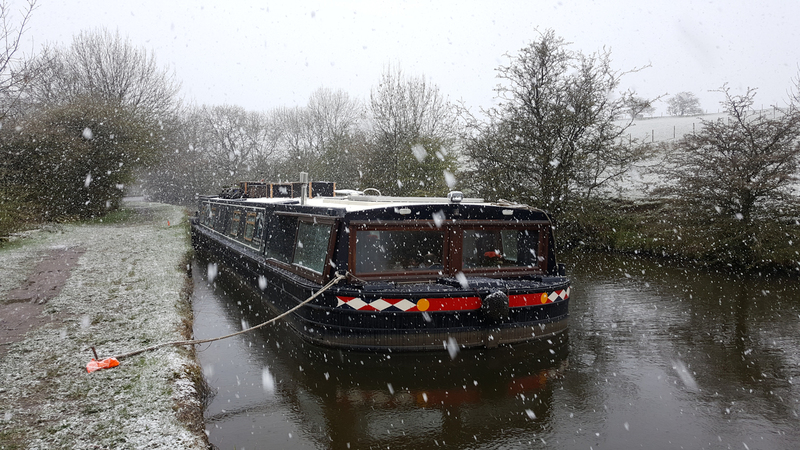 Having finished the season planning has started for scheduling in the work on the boat. We are finishing up the 2017 cruise descriptions and will issue them shortly along with putting the schedule up on the site. We have also been sorting through the photos for the season, we will put a bunch up on the gallery over the next few weeks, and have been struck by how many fabulous sunsets we had this year. 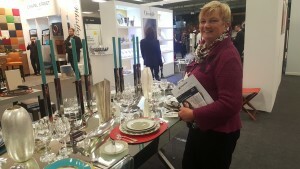 At the Independent Hotel show. 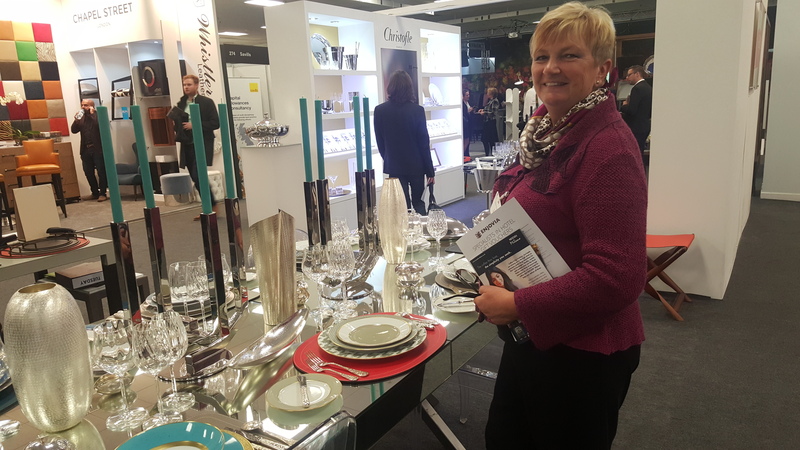 Agentia stand has some great products. Looks like Gina is buying some so look out for them next year! Just setting off to do our presentation for the Lancashire Tourist Awards and saw this, what lovely light. Lots of good questions and actually a fun experience. We think the presentation went well, will find out at the big awards evening on November 5th in Blackpool. Well the season is now over. Many thanks to all our guests this year and to those who have booked for next year and 2017. 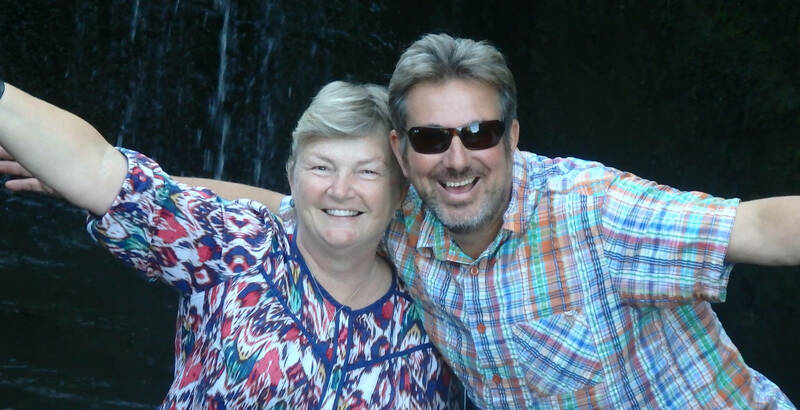 Also a huge thanks to Glen who makes our lives so much easier and always lights up the boat when she comes, don’t let her know I said that though. Lady also deserves a mention for her sterling work. Finally to my lovely wife Gina who it is an absolute joy to work with. At last a breakfast cooked for her. 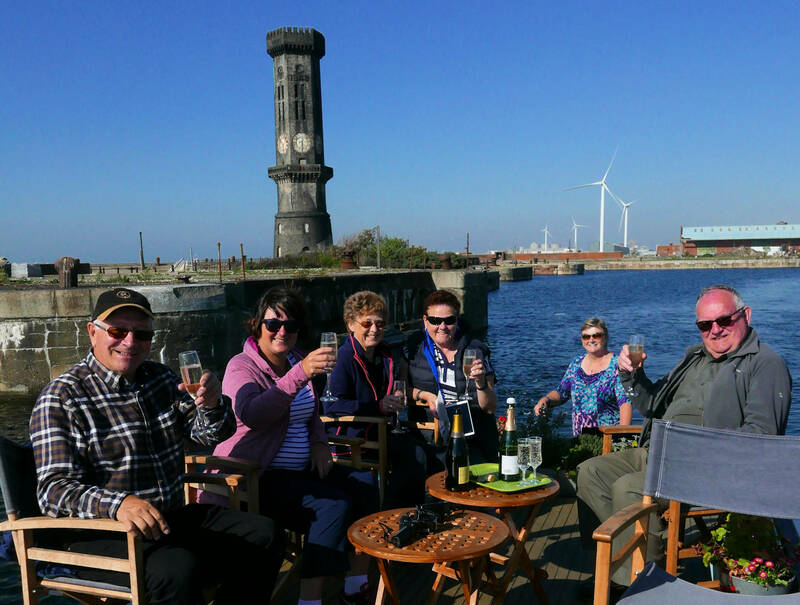 Salthouse Dock – Enjoying our work! 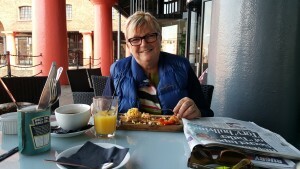 Sitting in Salthouse Dock Liverpool, sunshine, a light cooling breeze. What a great way to work! So lucky we can enjoy our work, Veronica, an Australian guest, took this picture just to prove it. 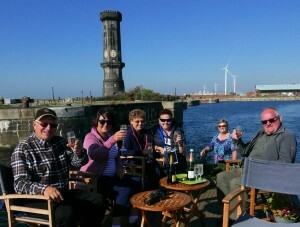 Our last cruise of the season and here we are once again toasting Liverpool in bubbly as we sail in. What a fab place to visit, excuse the pun! We are proud and thrilled to be finalists in the Lancashire Tourism Awards #LTA15. 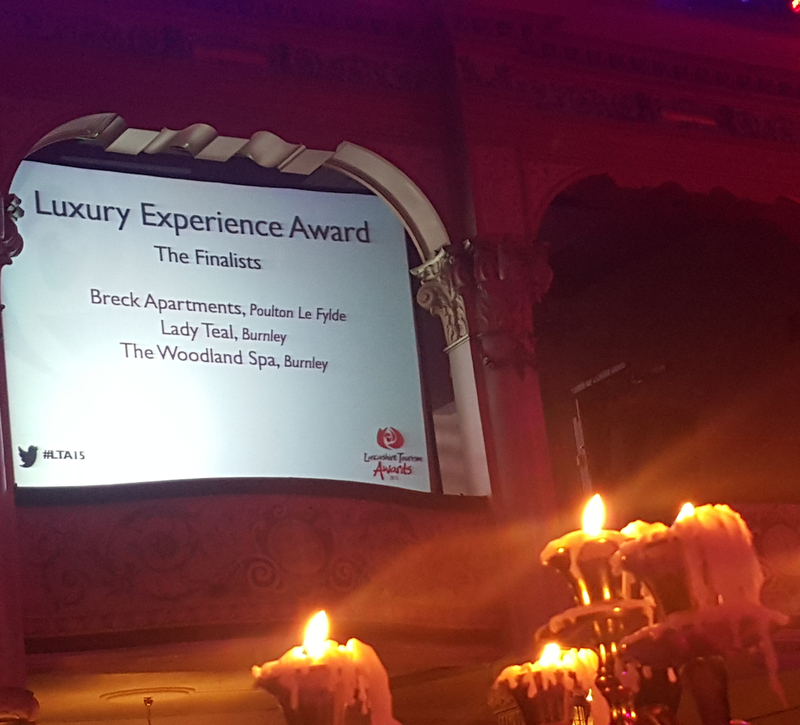 Breck Apartments, Blackpool @BreckApartments & The Woodland Spa @TheWoodlandSpa , Burnley are the other finalists. Alan and Wendy, happy upcoming golden Wedding anniversary. 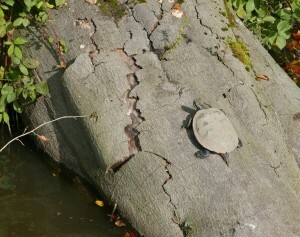 This was a first for us on the canal, a Terrapin maybe? 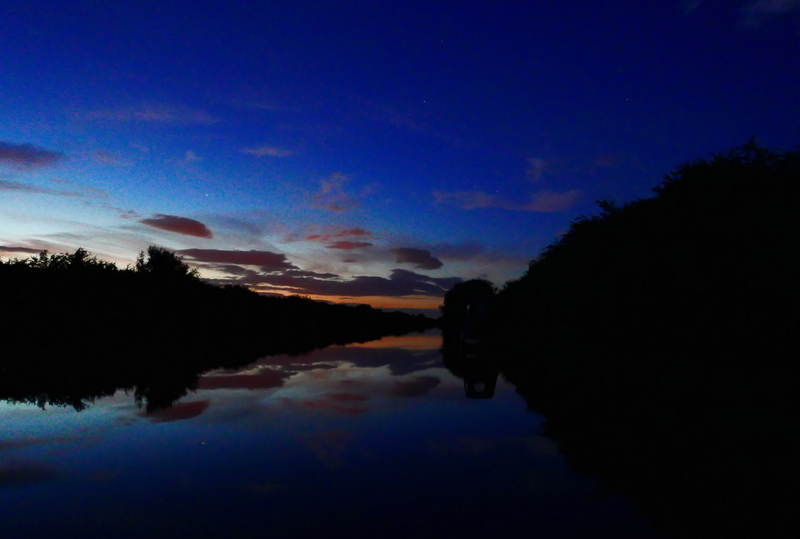 Well an amazing run down #wiganlocks. We did it in 3 hours! A new record. Another fabulous day and so late in September. Here we are near the top of Wigan flight, yes honestly Wigan! 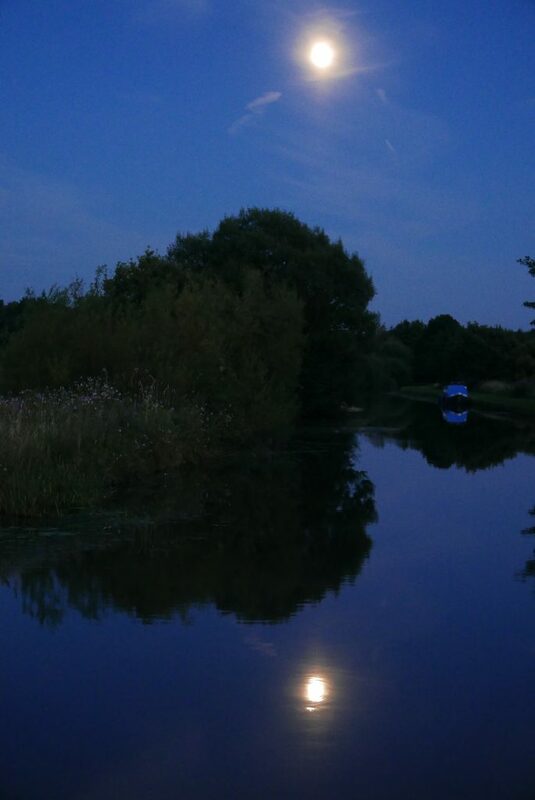 Great picture taken by one of our guests, thanks Derek. 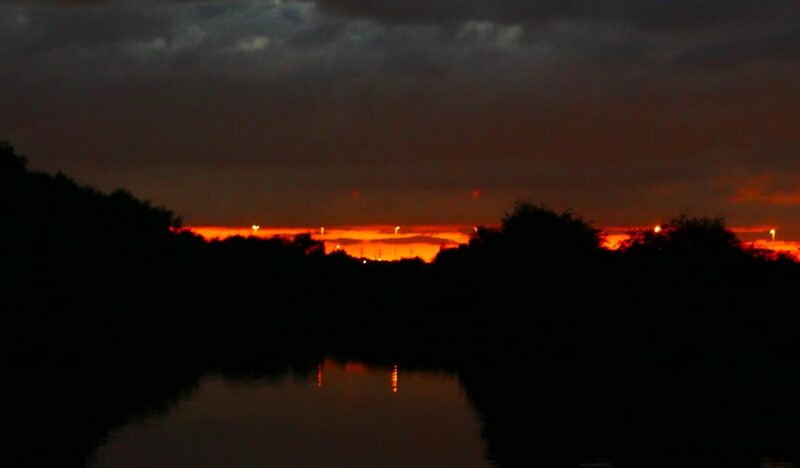 Truly was taken this evening and no special effects this really is Lancashire! Well almost the end of the season now. 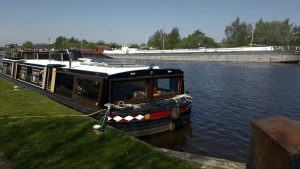 Just two cruises left and we are looking forward to them as they pass through the great Lancashire countryside and then down Wigan to Liverpool, a great trip and fab , excuse the kind of pun, place to end the season. 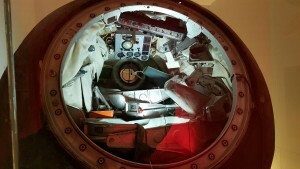 Got tickets to a preview of the Russian Space exhibition at the science museum, really good, Gina tolerated it for a quck break up in the big smoke. An yes that was London in the sun in the picture. 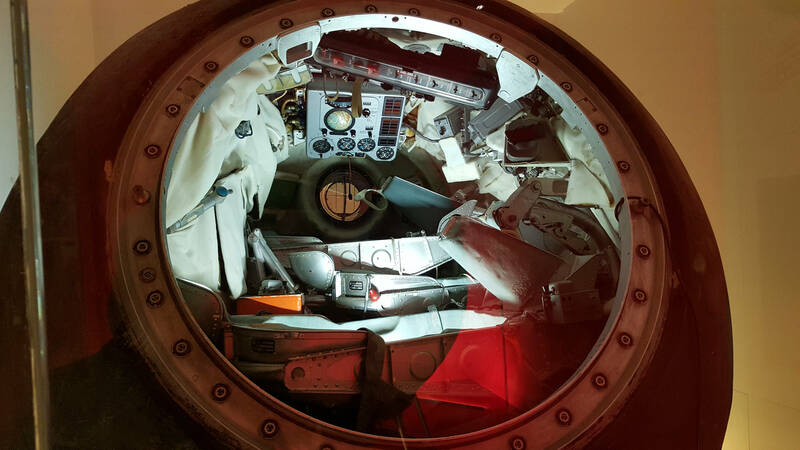 Don’t think we will look to the Russian space program for cabin designs, thats for 3 people! Woke up to a blue sky and low hanging fog, fabulous. What a great morning, and to top it off there goes a Kingfisher, amazing! We are so lucky up here in Yorkshire to be able to moor in spots like this! 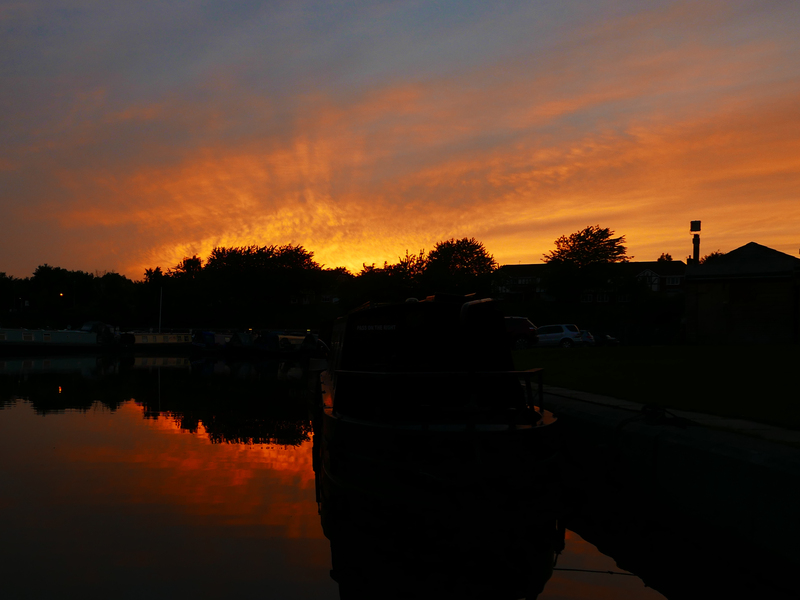 Another glorious end to a lovely day on the L&L having done the amazing Bingley 5 Rise.